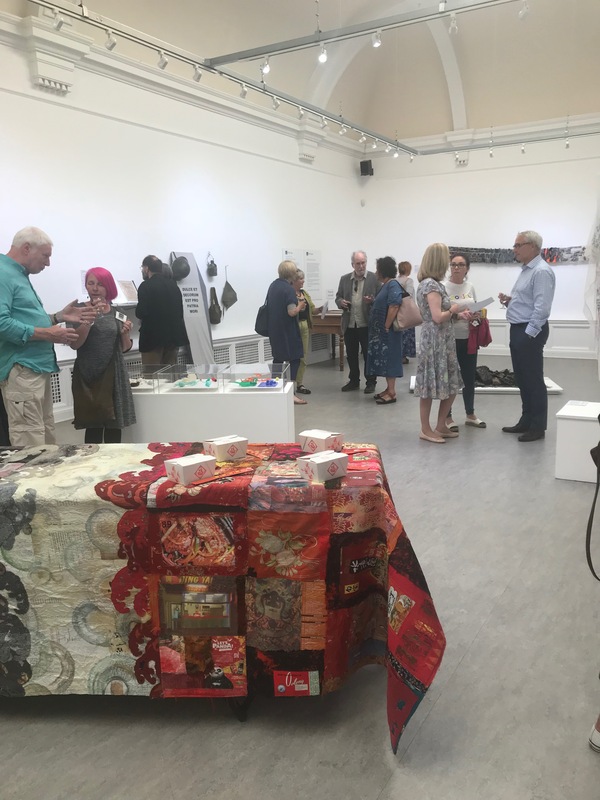 Regular readers of this blog will know that an important aspect of membership of Textile Study Group are the twice yearly meetings we have that include CPD workshops with some of the leading contemporary artists. Our recent weekend with Michael Brennand Wood, internationally known visual artist, proved to be every bit as inspiring as anticipated. Since graduating Michael has built an international reputation as one of the most inspiring and innovative artists working in textiles. His work has always reflected his belief that the most innovative contemporary textiles emanate from an understanding of both textile technique and history. 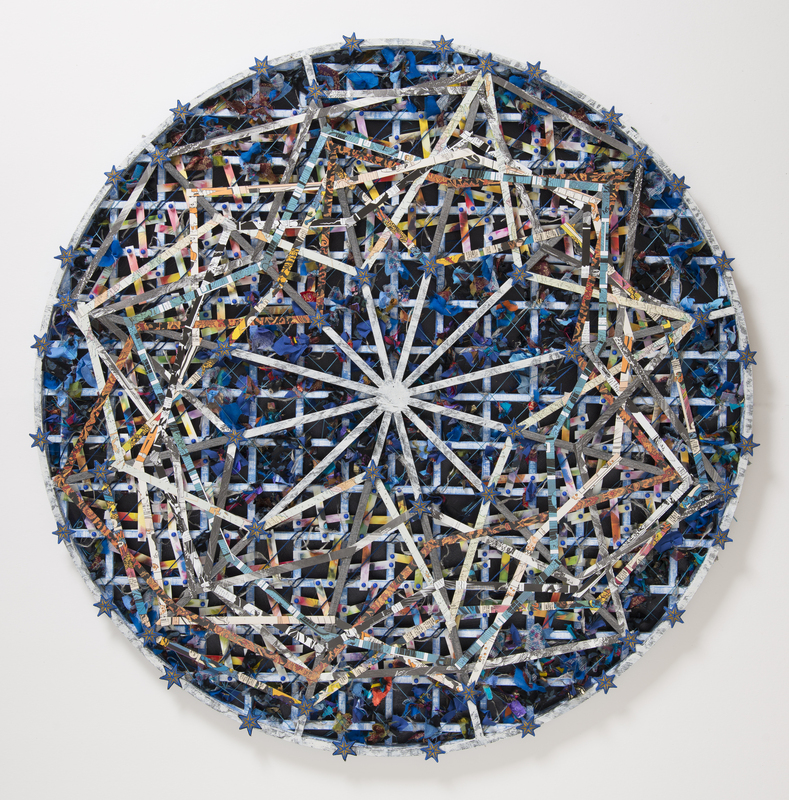 Throughout his career Michael has continually explored new and imaginative techniques, integrating textiles with non traditional materials. 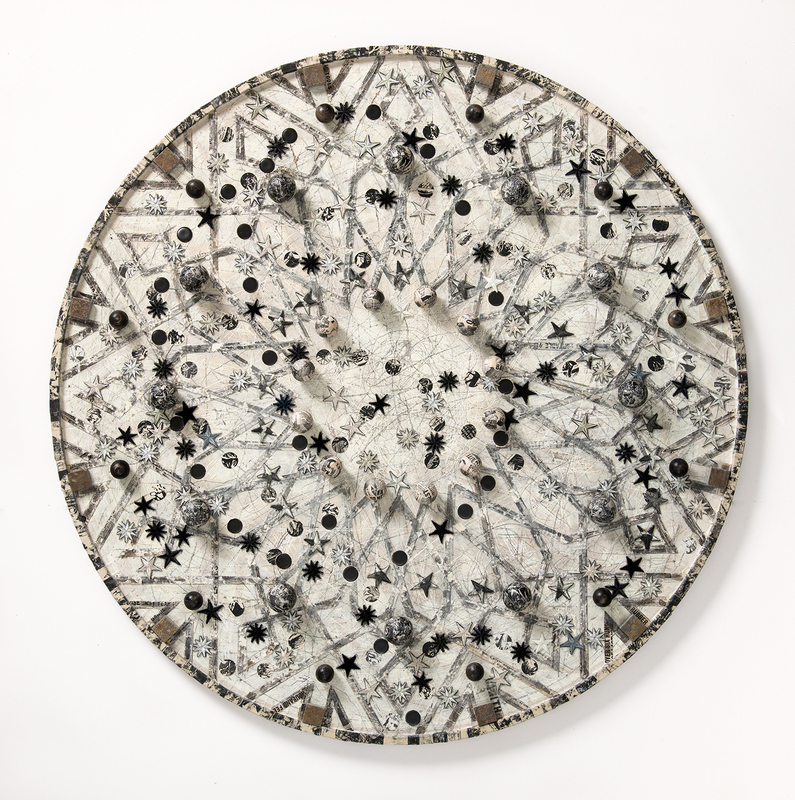 Examples of Michael’s work can be found in corporate and private collections around the world including the Victoria & Albert Museum, and he has been the recipient of prizes both at home and abroad. Michael has curated many exhibitions and until 1989 was a senior lecturer in the department of visual art at Goldsmith’s College. He has taught extensively in colleges and universities in the UK and overseas and undertaken residencies in Japan, Australia, New Zealand, Canada and Belgium. He was appointed Visiting Professor at Manchester Metropolitan University in 2005 and a Research Fellow at the University of Ulster. I was able to spend a few minutes with Michael over coffee at our Textile Study Group CPD weekend and commented to him that he was spending a great deal of time talking to everyone and discussing their projects. How important is teaching and mentoring to you, Michael? Teaching and the discussion of ideas has always been an important part of my life. I’ve always maintained that you learn as much during a workshop, from the other participants as you do from the tutor. Watching other people problem solve, is both a privilege and an education. You very quickly learn, to never say, that something won’t work. People’s ability to take the most bizarre and seemingly disconnected subject matter and evolve a new line of inquiry is a constant surprise. From my perspective it’s a form of continuous education, dipping into other worlds, sharing ideas and exchanging war stories of difficult processes and frustrating results. Plus, you rarely have to explain yourself; if you spend a lot of time alone, a weekend course is a fantastic opportunity to see if your visual language is working. Do other people understand what you’re trying to do, are they excited, interested? We all need positive, critical feedback to move forwards. Your CV is extensive and you have done a wide variety of things including curating and teaching. How important has been your teaching in the context of your work and do you enjoy the challenges of curating? Teaching was always important, it provided a chance to meet and problem solve. Goldsmiths was my second education, I gained a great deal from my interaction with both the students and staff. In the early days I really missed it when I wasn’t there. I only ever taught up to 3 days a week, the ideal is probably 2 days. Beyond a certain point it became less interesting, more and more students, less staff, a reduction of part-time staff and loss of technicians. As workshops closed the culture moved towards an academic non-making, almost part time drop in for a tutorial or seminar mode. Studio culture disappeared, as students increasingly didn’t have a permanent workstation. The rise of corporate culture, endless meetings and the demise of the Art School ethos contributed to my own departure, it ceased to be interesting. Curating is another aspect of my creative life, The Makers Eye, Restless Shadows and Fabric And Form etc. all changed my life. If you accept that a large part of my creativity is the collation of material and ideas, it’s not surprising that I’d be interested in assembling and selecting artworks also. As with most things I do, I like to keep ideas fresh, so curating is very important but I don’t want it to become a job. It’s another creative outlet that allows me to explore ideas and question hierarchies. What are the main influences currently on your work? Music, history of textiles, travel, physical geography, structure, I’m constantly comparing and seeking to understand how the material, subject matter I collate, connects. That’s the adventure, the older I get, the less interest I have in planned thought. The studio is a place where things evolve; I don’t wish to know what is going to happen next. If I did then I’ve probably already been there conceptually. People always seem so anxious about making mistakes, if something doesn’t work it’s a useful building block, evidence of a process that needs to change or evolve. I view myself as an independent, so inevitably I’m drawn to that quality of thought in other art forms. I have no interest in corporate thinking or making artworks that fulfil other people’s criteria. Do you prefer to work in a studio at home or do you adapt easily to the physical space in which you find yourself? I’ve worked all over the world, in temporary studios during residences. In general I can be up and running creatively, in a few days. New spaces exert their own influences on work and that can be just as exciting as the locality. People often assume that if you work in another country then your work will reflect that particular place. The studio invariably, is what changes the work; a bigger space might well enable you to create in a different way. Even the fixture and fittings in a room can provoke new thoughts. I prefer to work at or near home; I like to re-visit the work at different times during the day, sneak up unexpectedly to catch it unawares. Artists have always sought to look at what they are doing from unusual angles or via a mirror, first thing in the morning or last thing at night. They are all variants or trying to see a work clearly again, as if for the first time, without any accumulative considerations. If the works close physically then it’s an easier process, plus you get more done, if you loose the travel time back & forth to an outside studio. You are well known for the use of non-traditional materials in your work, do you have a favourite and would you advise textile artists to experiment? Not particularly, wood was always an important material alongside textiles, the feel of the two materials together just works. If you looked at my work over the years, you can see a very deliberate use of alternative materials and approaches in conjunction with traditional textiles materials and processes. I’ve always said, that I’m not interested in ossifying traditions, drawing a line around an area and keeping everything the same. Creativity is replaced by policing and that is of no interest to me. Part of my role has always been advocacy, promoting new textiles and fusions of materials that are reflective of the times we live in. The majority of my creative work is based on an extension of traditions, not a rejection. The past therefore, will inevitably be part of the present and each generation should ask questions as to what the future might become. It’s probably also worth pointing out, that culture only really changes through the process of doing something. 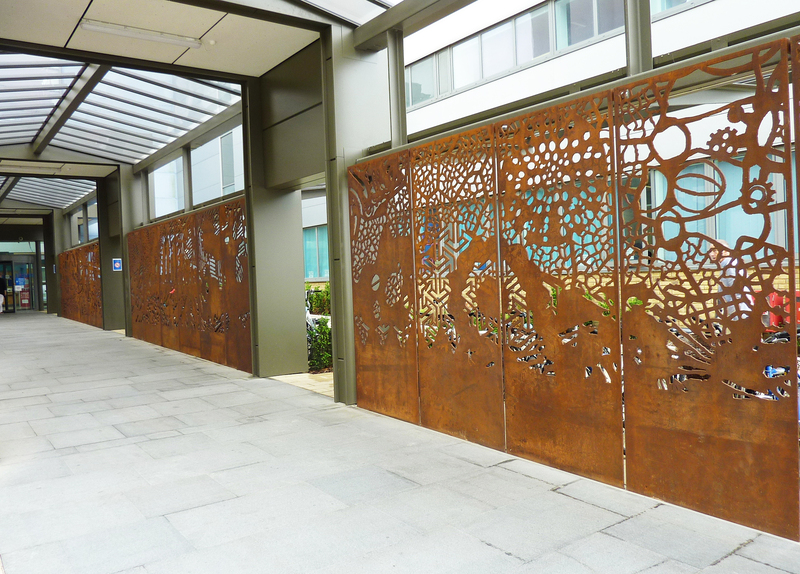 If I create a series of Corten Metal Screens, for a building that have within their design sensibility, a reference to Lace and Pattern, I’d like to think that hopefully I’m quietly questioning, the prejudice that those two areas of image making invariably incur. You have completed several large pieces for hospitals and at our recent weekend you showed us photographs of a design that has been commissioned for metal panels at the entrance to a hospital. Would it be fair to assume that one of the reasons you are attracted to these projects is your belief in the benefits of the arts for wellbeing or is it just that the scale of these projects act as a balance for other work? It’s well understood that Art is an aid to healing, if you spend time around a Hospital anything that positively distracts or engages a patient or visitor is to be welcomed. I complete a large Public Art work around every 2-3 years, I’ve also worked a lot with music venues, libraries and museum collections, so Hospitals are part of that portfolio, of non-gallery outcomes. 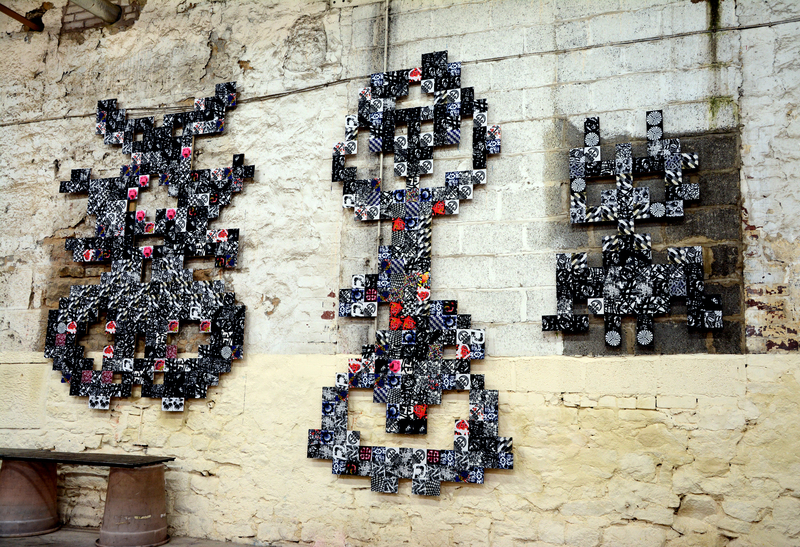 I made 3 pieces in 2016 for Standfast & Barracks, a textile printing company in Lancaster, the works are permanently installed in a working dye room in the factory. I really enjoyed placing work in a non-white gallery, perfect box. I am drawn to commission opportunities that give me a chance to experiment with scale and material choices. All projects feed back, into the Studio Works which are the most important and central aspect of my work. We are almost at the end of 2018, what plans can you tell us about for the coming year? 2018 will see exhibitions in Amsterdam, Munich and workshops in Canada, USA and UK, including 2 at West Dean. I’ve a residency at Broadgreen Hospital, Liverpool working with patients on the stroke and rehabilitation wards. I’m also changing studios from a domestic to a factory location, which I’m very excited about, a proper honest working space. It used to be a braid factory, dance hall, sign company and cinema, so very appropriate vibes, for future works. Thank you, Michael, for these insights into your practice and for your input this weekend. If you would like to see more information about Michael’s work it can be found at his website here. 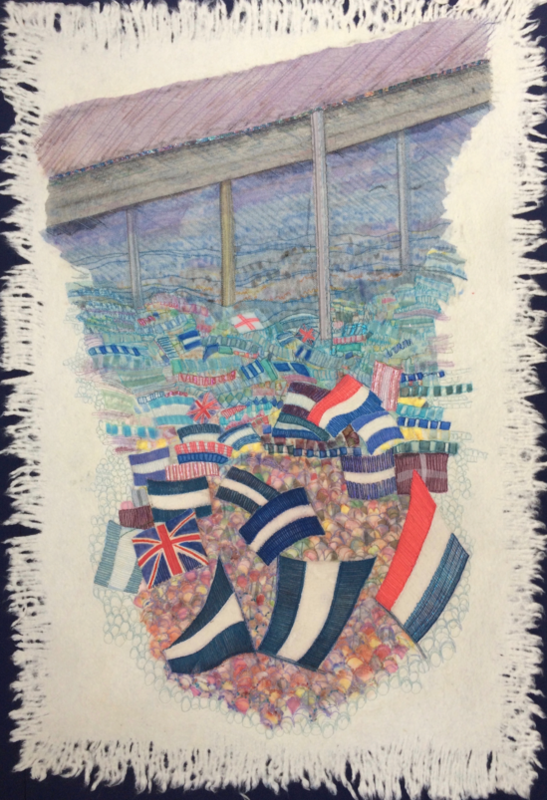 As the festivities approach our Seasons’ Greetings to everyone, but for now, until the next time..
A long-standing Textile Study Group member, Mary Youles, died on 24th June 2018 and to celebrate her extensive and profound commitment to the world of art/textiles we have decided to post this commemoration. Most of us will remember a slightly different Mary; friend, colleague, tutor, critic, supporter and mentor and in each of these roles she was essentially herself: steadfast, friendly, supportive, funny and often totally irreverent. She remained forthright, sometimes quite naughty and with a splendid sense of fun. The essential spirit that was Mary remained in place even in her last days. Mary was quite modest about her own achievements. Her influence in the field of textiles and embroidery was considerably wider than simply her contribution to the Textile Study Group. 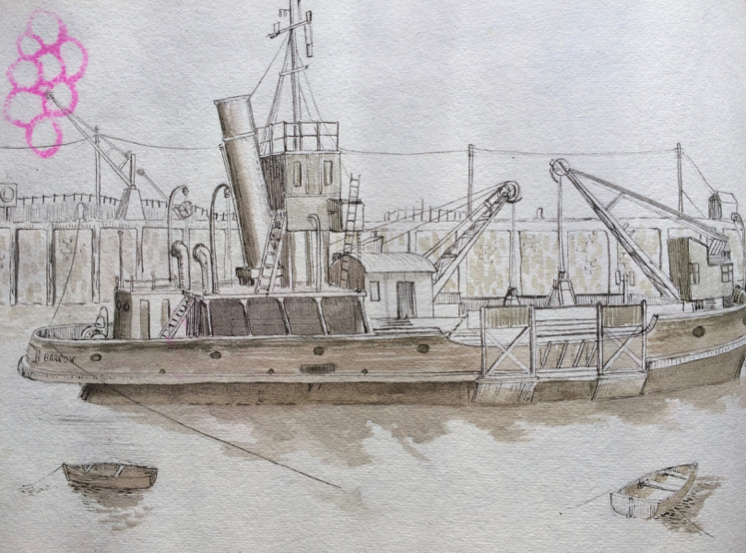 I have started this review with some lovely examples from a very early sketchbook. Mary Joan Martin was born and grew up in Silloth, Cumbria in 1930. She trained at Carlisle College of Art gaining the qualification of her time, the Intermediate Examination that allowed her to move into the National Diploma in Design (the NDD being the degree of it’s day). 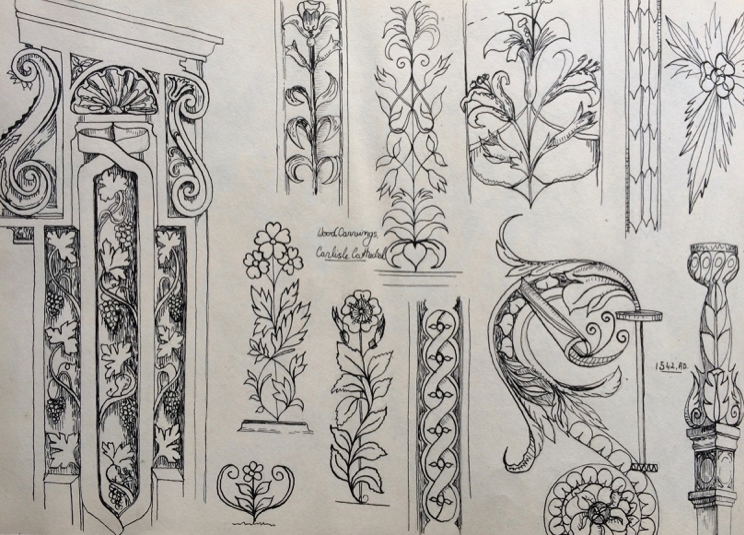 These four sketches from her NDD sketchbook reflect what became lifelong interests in architecture (both splendid and vernacular), popular culture and plant forms; her sketchbook from this time is inspiring and prolific. 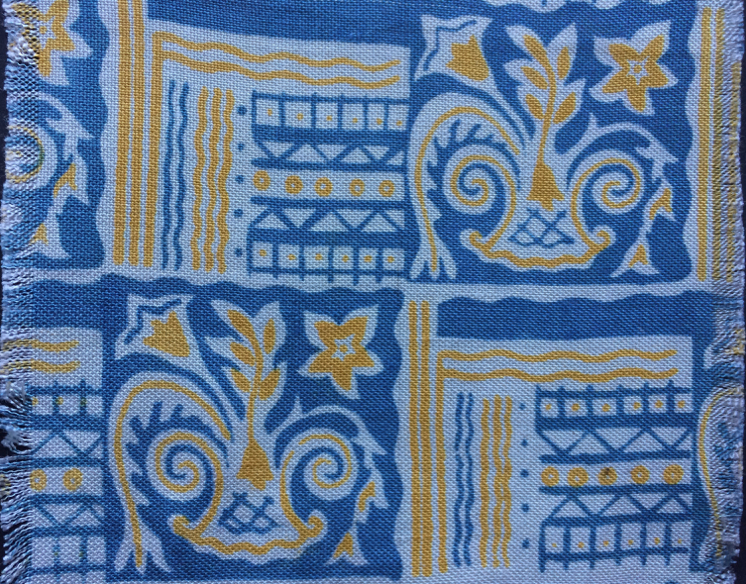 For her NDD Mary studied textiles; both print and weave, two very different skills. 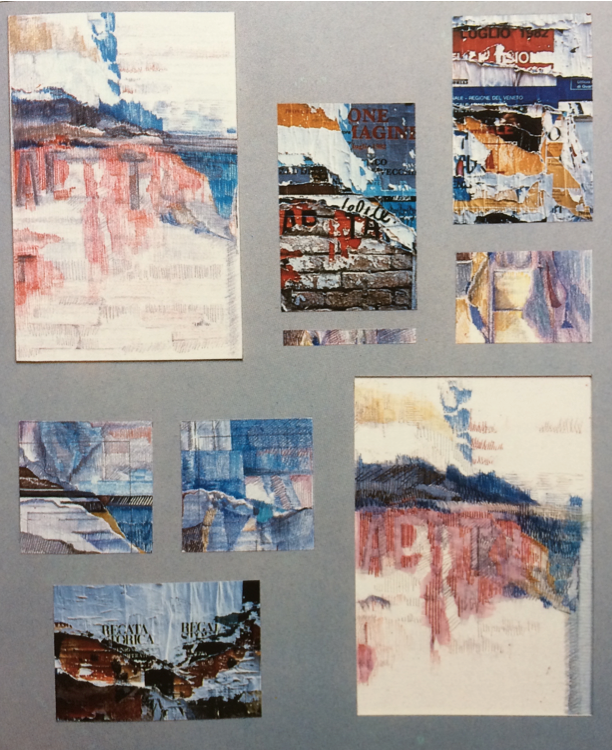 These pages show some of her room designs and one sample of her textile print work. 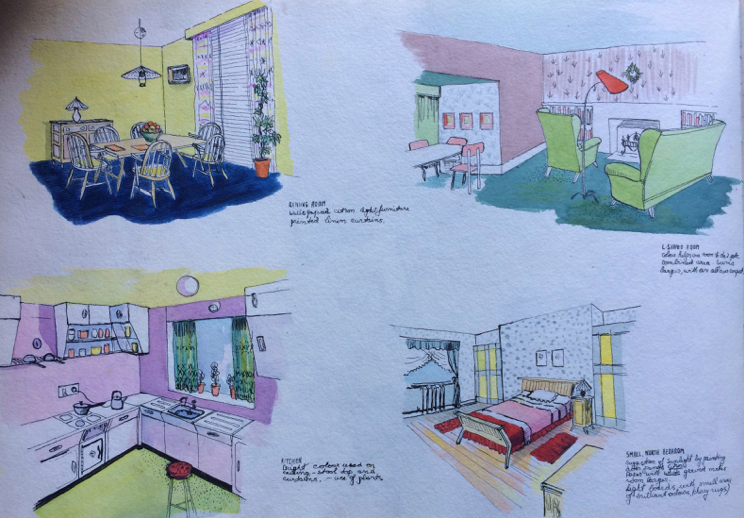 The following sketches, dated 1952, reflect some of the overriding design inspirations of the time. 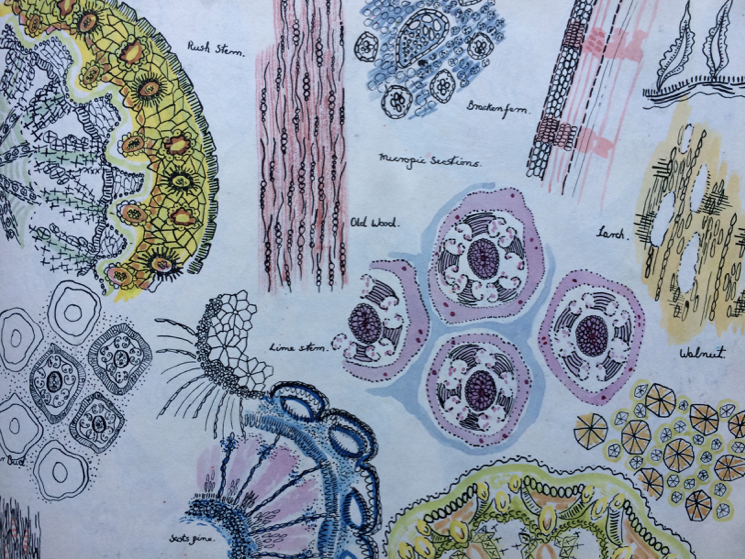 This is just one of many such pages where cell structures dominate are evocative of work by the Festival Pattern Group. 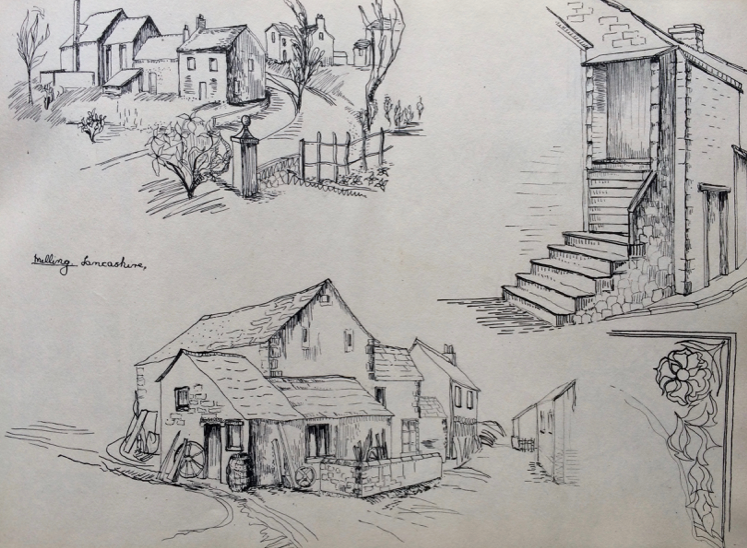 Sketches made whilst at the exhibition of National Diploma work, The Cotton Board 1952. Despite her modesty about her talents Mary was special enough to gain entry to the Royal College of Art. Very few people achieve this, let alone someone of Mary’s generation. She gained a DesRCA that included a year in industry. 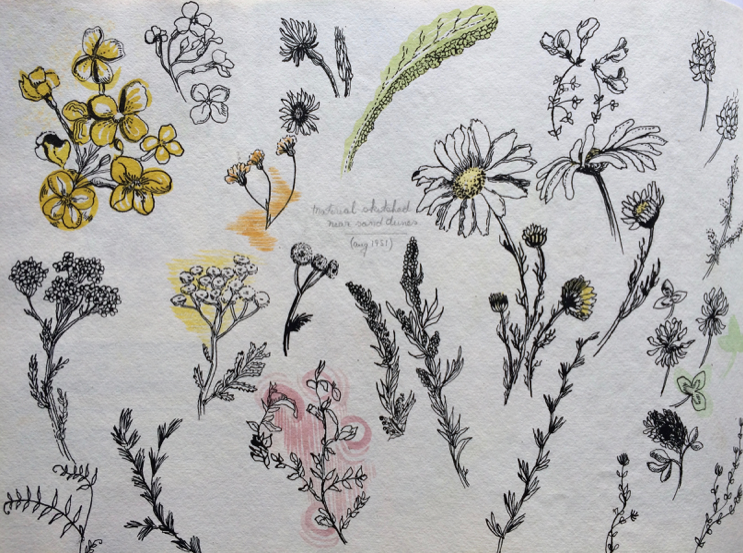 ‘During her Carlisle period Miss Martin showed early promise in textile design, her colour and design sense being good and she had a natural ability for plant drawing. …all her studies were of a searching quality which greatly added to her versatility as a designer… Her course covered both printed and woven textiles, but it was very evident that she had outstanding ability in the latter direction. Her work for the National Diploma weaving examination was seen by the authorities of the Victoria and Albert Museum who expressed great interest in it while at the same time it was displayed in the Ministry of Education Exhibition of Examination work’. Mary spent her industrial year at textile mills in Bradford, West Yorkshire, subsequently working as a Jacquard designer with Brown, Vickers and Co. Ltd. and then Wilson and Glenny, Hawick, Scotland. Following graduation Mary gained approval from various quarters. ‘New Designs in Man-Made Fibres 1956 Exhibition staged at Hamilton House by the School of Textile Design of the Royal College of Art’. 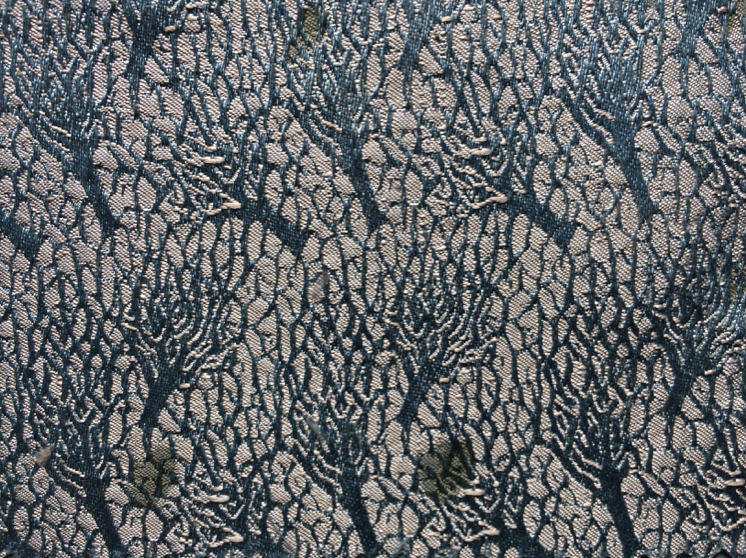 Jacquard woven damask, warp cotton, weft acetate, designed by Mary Joan Martin. Despite these early successes in industry Mary moved to take up various part-time posts in teaching, both in schools and art colleges; a demanding schedule of some concurrent part-time posts working at Sydenham Comprehensive School, Barking College of Technology, Southend College of Art, and Gravesend College of Art before moving in 1967 to full-time lecturing and then a senior lecturing post at Whiteland’s College. Whiteland’s was eminent as a teacher training college and whilst there Mary taught alongside Jan Beaney and Audrey Walker, both of whom held Mary in high esteem. 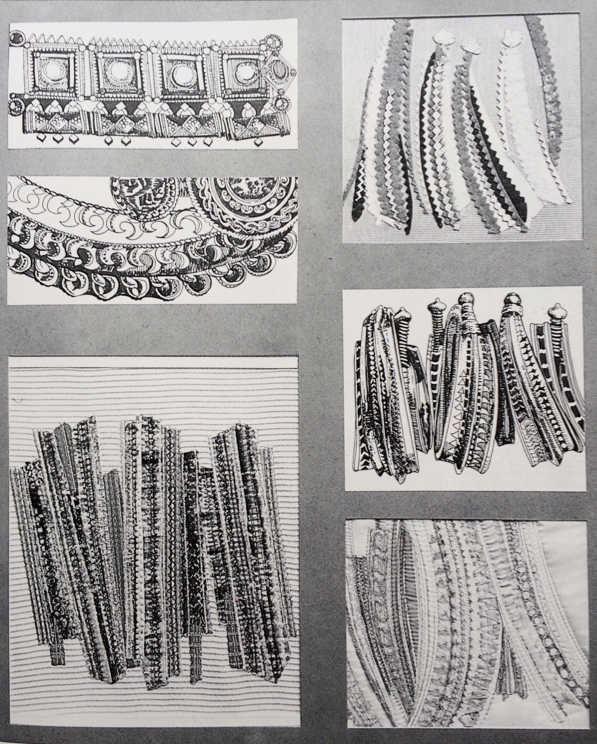 Whilst working Mary also trained for a further specialism, taking embroidery at Goldsmiths from 1962-1965. During this busy time Mary met, and in 1961, married Tony Youles. They met at a London climbing group and adventures encompassed the Lakes, Scotland and the Alps where both enjoyed climbing and skiing. Tony died last year and many suggest that the longevity of their marriage was due to the fact that they lived in separate cottages a short drive from each other! 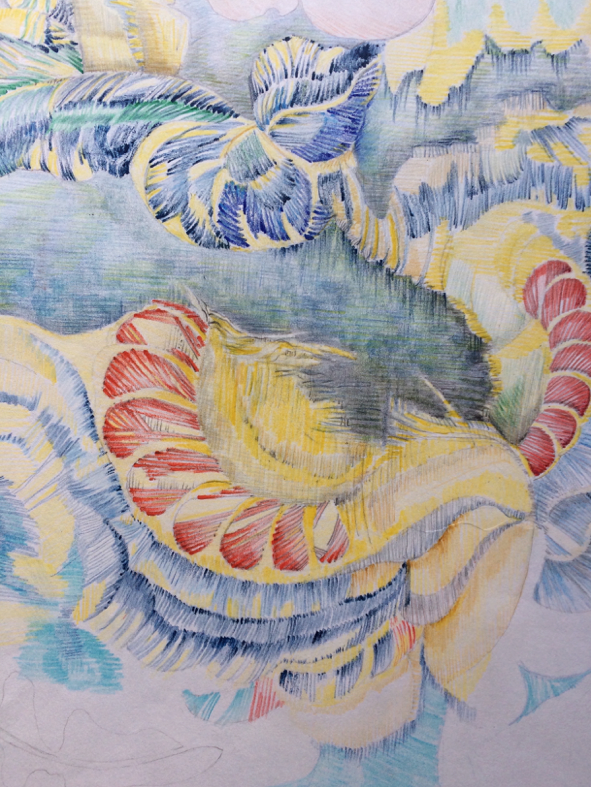 As well as teaching Mary was also producing her own work; it was of such merit that she was able, in 1965, to join the prestigious ’62 Group, which was a platform for the exhibition of pre-eminent textile artists. During her time with the group Mary served as both Chairperson and secretary. She exhibited in each year that she was a member and was also an active participant in Embroiderers’ Guild exhibitions. In this exhibition Mary exhibited Eclipse II. Then in 1969 with the exhibition ‘Embroidery Today’, which opened at the V&A and then toured; Mary exhibited two pieces called Double Take I and Double Take II. Other named pieces that I can trace are Spring in the City featured on the front cover of Embroidery Volume XXI, No.3 Autumn of 1970 and Big Dipper shown in the summer exhibition of 1971. Intersection 1966. Bands of tablet weaving set into an outer frame and caught into the background in a few places. Between are areas of varied texture applied by zig-zag machining in purples, blues and greens. Eclipse II 1968. A white background with applied velvet ribbon, threads and beads. 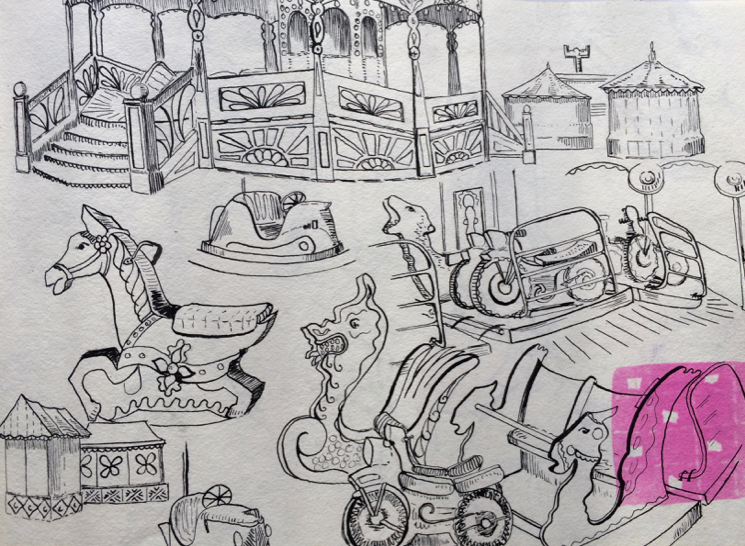 Her early work concentrated on ‘strong design elements found in traditional ‘pop’ images – the sea-front Amusement Arcade, Fairgrounds and Music Halls’, some of these elements remained within her work, as did elements of a high standard of craftsmanship. ‘For me, there is a great satisfaction in accurate workmanship’. 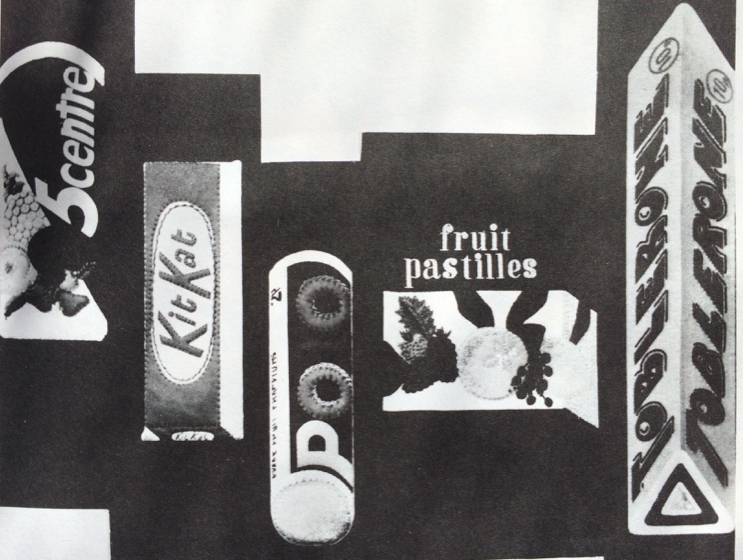 This piece was exhibited with the 62 Group at the Commonwealth Institute in 1974. This was also her last year at Whiteland’s College of Education and the start of her life in Gloucestershire where she moved to her much-loved cottage in 1973 and took a Senior Lecturing post in Art and Design at Gloucester College of Education in 1974. She continued tutoring a variety of professional development courses in the Art Education world including the legendary Barry Summer Schools (‘till 1973), and weekend courses at the Embroiderers’ Guild. 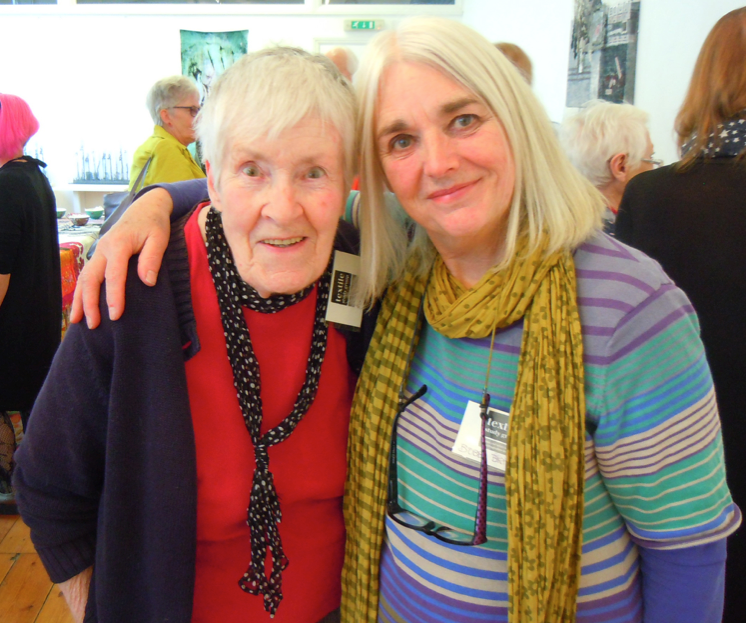 It was at a Whiteland’s summer school that Mary first met one of our members, Alison King. Mary Youles – the woman who changed my life! This seems like a very extravagant claim but it really is the truth. So many things that I have gone on to do in my professional life are as a result of her intervention as a tutor more than 40 years ago. I had the huge fortune to end up at a Summer School in Whiteland’s College in 1974 due to the encouragement of my mother and husband. With one small toddler and another baby due any minute they had decided between them that I needed a break and the College was not far from my parents home. The tutors that year were Mary Youles and Audrey Walker – how lucky was that! 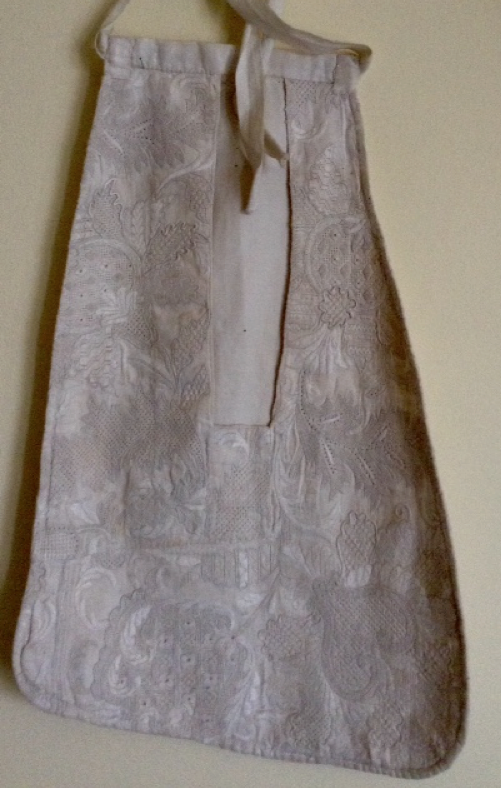 Although I had a Fine Art degree (painting) by then and a little experience of working with fabric in my teaching, I had little more than a few dressmaking skills to play with. The wonderful Mary Youles, however, was able to see beyond this and I had a great time experimenting and developing ideas for three-dimensional structures. Under her watchful perceptive eye and wonderful sense of humour I became completely hooked. Not long after she and Audrey encouraged me to apply to the 62 Group and suddenly I found myself in this fantastic world of textile enthusiasts and the chance to exhibit in many new and different venues. I am sure that Mary was also instrumental in inviting me to tutor the TSG in Stroud and subsequently engineering an invitation to join our fantastic group. I also had the pleasure of being her tutor sometimes. She came as a student on my very first TSG Summer School in Bath where I remember she made an amazing kimono like hanging. She could be a little bit naughty at times, talk too much and plough her own furrow but oh she was so talented in every way. I think of her still out on a dark cold night feeding her donkeys when we were all warm and well fed in Hawkwood. Over the years Mary really became a role model for me. I often thought if I could only have half such drive and vitality into old age it would be wonderful. An amazingly youthful Mary Youles and Alison King in 1974! Obviously there are many more pieces exhibited with the 62 Group to discover; some twenty years worth! (It may be worth reminding younger readers that colour photography and printing were very expensive and early ‘catalogues’ were sometimes just a list of names and titles, if that.) It would appear that Mary resigned from the 62 Group following their 1983 exhibition in the Victoria Art Gallery, Bath, where her diary recounts that she was stewarding and collecting her work! During her membership she exhibited at TUC Congress House, National Museum of Wales, The Commonwealth Institute, The Mall Galleries London and Dublin National Exhibition Centre. She also exhibited at International textile fairs and galleries in Stockholm, Brussels, and Milan and took part in touring exhibitions in America, Australia and Japan and New Zealand. Mary remained a friend of the ‘62 group until 1995. Her work is in public collections across the world; Sweden, America, Japan, New Zealand and in UK galleries, including the Victoria and Albert Museum, London, many council collections and various private collections. Continuing to teach and exhibit throughout the 1970’s, with the Guild as well as the 62 Group, Mary gradually explored new starting points moving away from her interest in the paired-back geometric pieces seen above and perhaps the title of a piece exhibited at the Guilds’ open show in 1972 contained a hint of this, a Triptych Floating down to Camelot was described as ‘a collage in river greens, quietly effective’. 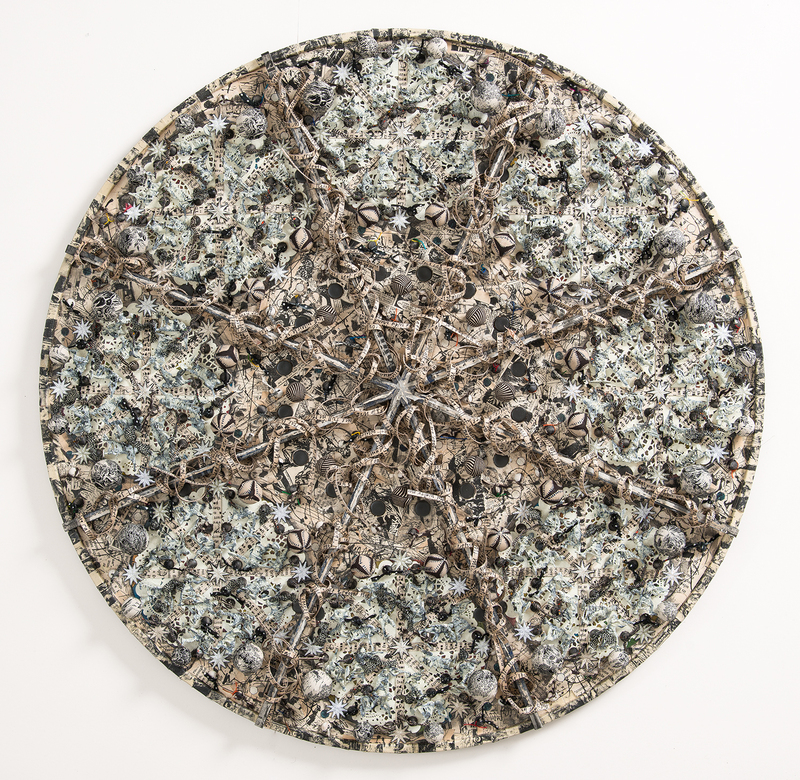 Around this time she also started to explore historical starting points making several pieces in the series ‘Bedouin Saddle Cloth’, one exhibited in 1977 at the 62 Group show held at the TUC sold (to a famous Trade Union Leader), another is pictured below. 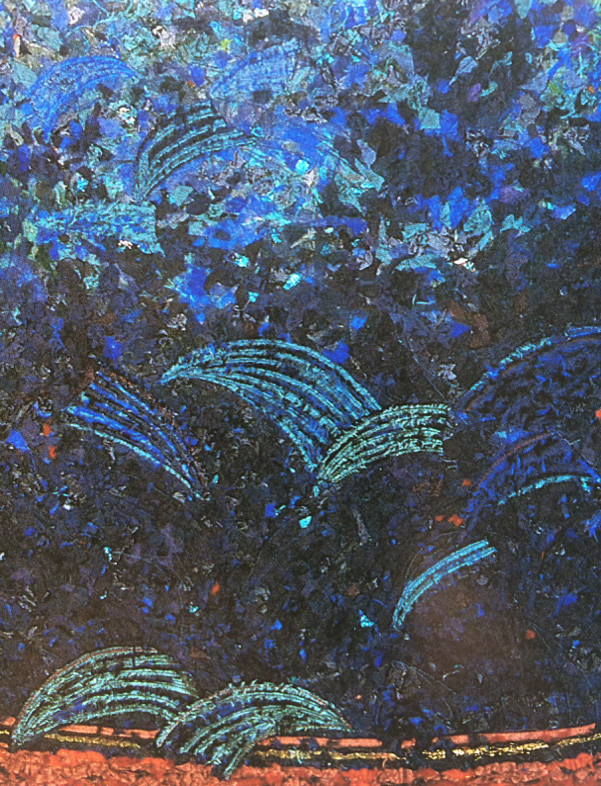 She exhibited Shawl Fragment with the 62 Group at the National Museum of Wales in 1979 and an associated interest was shown in Magic Carpet, the drawing and sample work seen below. In 1981 Mary returned to study, this time taking a Post Graduate year at West Surrey College of Art and Design, Farnham. 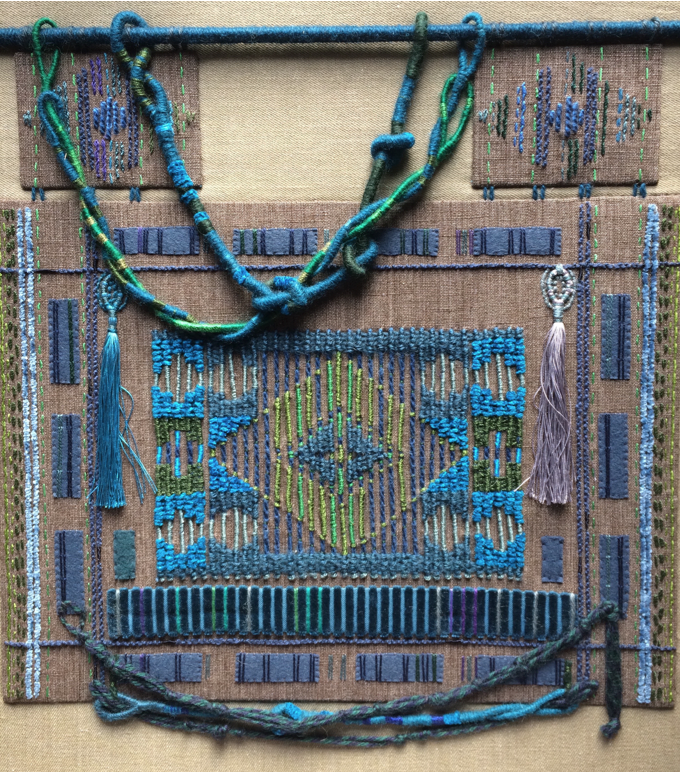 For a while she revisited her weaving and in her notebooks she keeps precise technical notes on the structure, threads, scouring, bleaching and dyeing, as well as aesthetic notes showing an interest in colour, abstract art, landscape, architecture, interiors/staircases, travel, and historical ethnic costume. 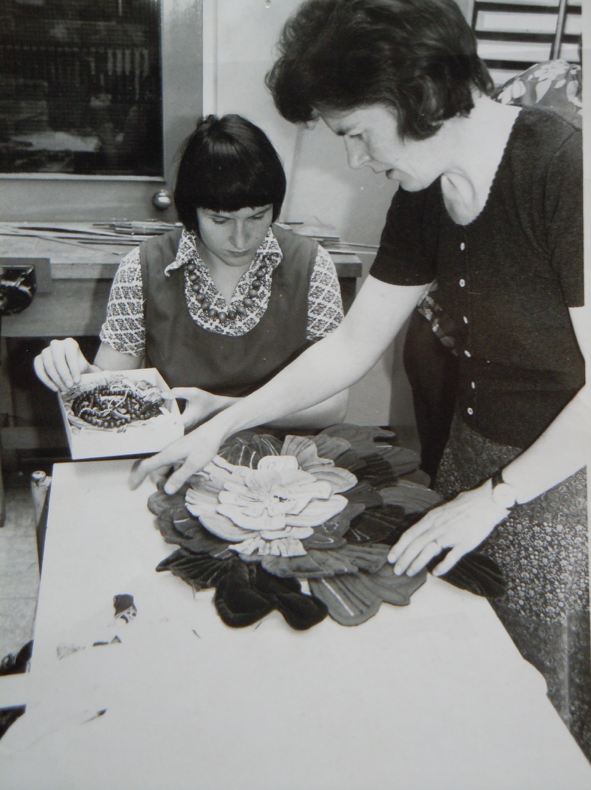 1981 was also the year that Mary began teaching the City and Guilds Creative Embroidery Course, leading courses at various colleges across the West Country until 2000, Bristol City College, Brunel College, Hawardian College, Cardiff and Malvern Hills College. Ultimately she also mentored her own exhibiting group, The Brunel Borderers’, of whom she was very proud. In 1982 Mary joined the Practical Study Group, now the Textile Study Group. We exhibit and teach and it’s only recently that Mary stepped down to become an Associate having played a full role in our activities; teaching weekend and summer schools, conferences / seminars, publications and exhibitions. At around this time several themes were recurrent in Mary’s work, often forming a foundation for different kinds of experiments / expression. Historic embroidered textiles from this country or around the world always inspired her, and her characteristic love of flashes of turquoise or magenta shine through many of the resultant pieces. An interest in architecture, sometimes interior details such as staircases, or the worn and weathered surfaces of historic buildings ultimately coalesced in a long standing passion for the commonplace: sheds and pigeon lofts, now threatened as we loose allotments and the once popular hobby of keeping pigeons. 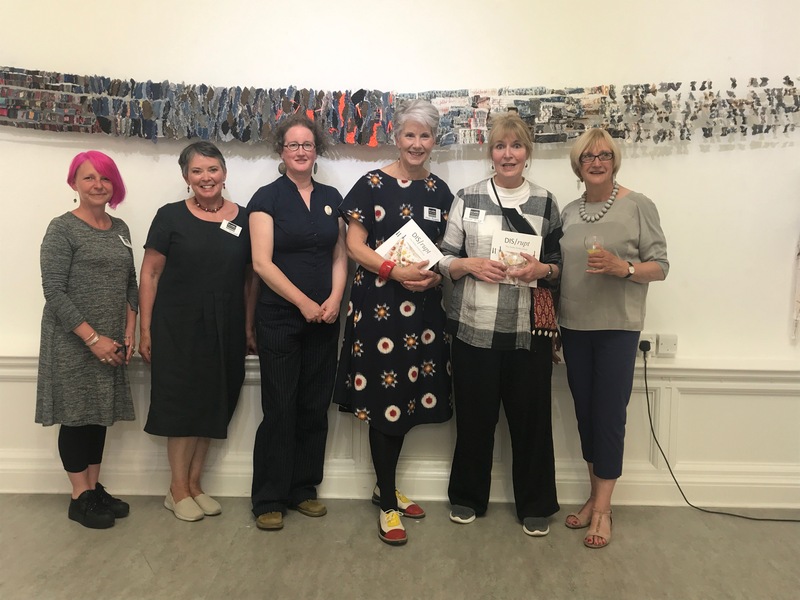 An abstract piece called ‘View along a corridor’ was the starting point for an Embroiderers’ Guild submission and the exhibition was held at the Commonwealth Institute. The pair of panels sold, but Mary was critical of her composition, writing in her notebook that the pieces ‘looked too cramped’ and what she would do to change a third piece in the series. The piece was based on drawings of the interior at Hawkwood College. 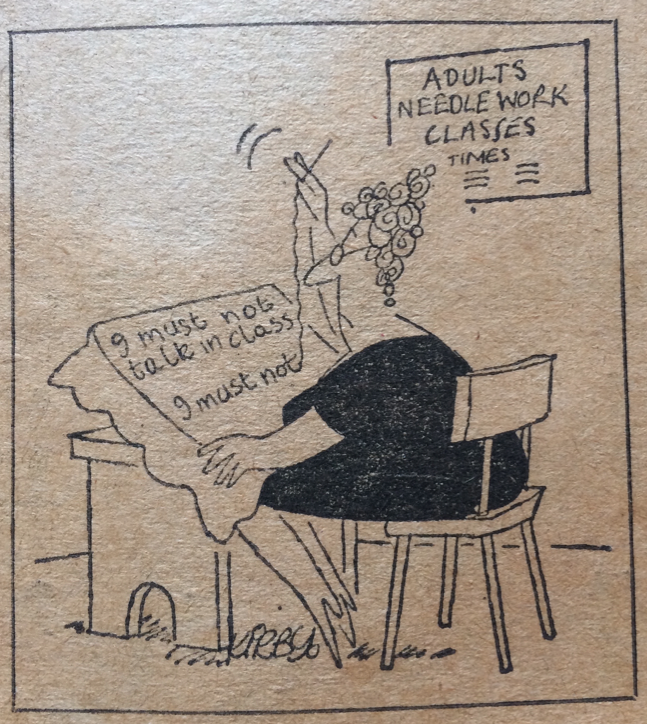 She also used the topic for one of her contributions to the first PSG book, Needlework School, published in 1982 and co-authored by PSG members Muriel Best, Vicky Lugg and Dorothy Tucker. In the same book Mary had three other contributions, both indicative of her interests. 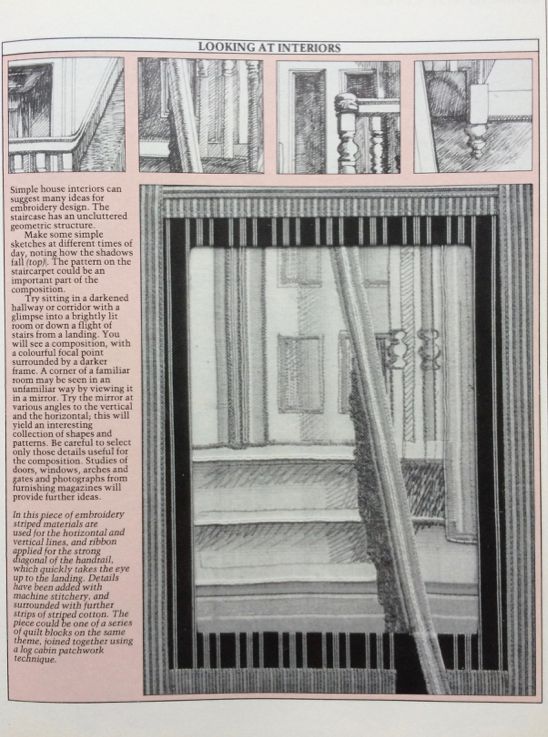 ‘Looking at Interiors’ on page 41, which incorporates striped fabrics as a frame for a view through a staircase and also pages 150, 151, 152 and 153. 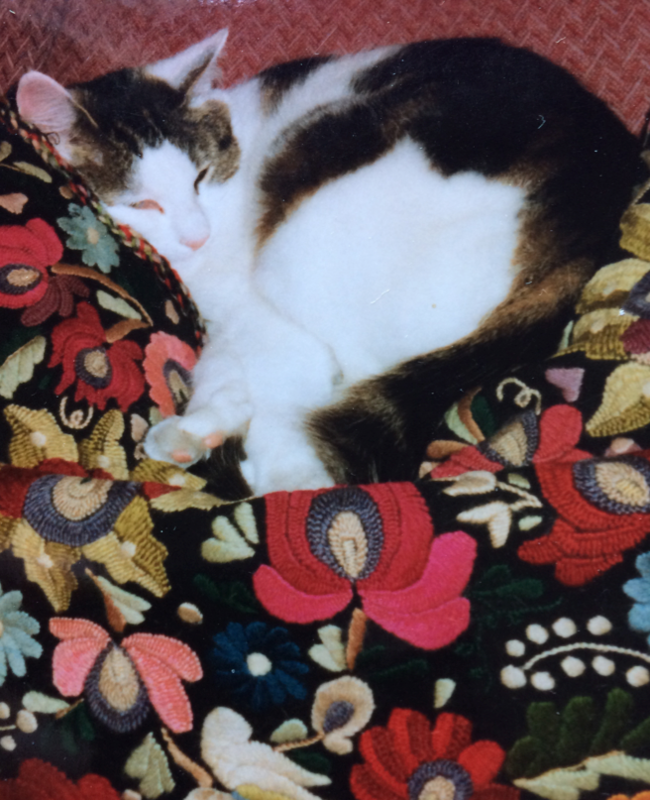 From 1978 and across the 1980’s Mary was also a full member of the Gloucester Guild of Craftsman, she was listed as an Embroiderer, and regularly took part in exhibitions and other activities. Just a glance through Mary’s notebooks and diary’s shows that she was very outgoing; she travelled a lot (Venice, Rome, Barcelona, Prague, Krakow and America), she attended countless exhibitions, shows, conferences, and classes often gaining new skills and supporting the activities of others. Mary was instrumental in discerning several suitable members for the PSG and encouraging those people to join the group, and was always welcoming to new members. Besides Alison, Mandy Clayton was another of the lucky recipients of Mary’s support. If only I had found more time for Mary. Through her I met some wonderful, encouraging, sharing practitioners in those early years. I call it the domino effect whereby jobs came in from really that first meeting with Mary. Yes, we first met at my degree show in 1982. She encouraged me to apply for ‘The 62 Group’ based on the work she saw which gave me an immense boost. (Although I got rejected twice, before being successful!) Mary and I kept very much in touch and through her also I taught the PSG for the first time in the 80’s….not quite knowing what I had let myself in for! At that time I was freelance, working on degree courses as a visiting lecturer; got my first foundation art teaching in ’83, as well as being involved with art advisors and doing quite a lot with school teachers especially papermaking, felt making and machine embroidery. No Internet! All contacts were through word of mouth or meeting people whilst teaching and exhibiting etc. I taught for Stroud Guild early on and also I was Mary’s City and Guilds moderator for a few years. The Guild work was all due to her encouragement. I won the Lynette de Denne award in about ‘84 which was equivalent to the now Guild Scholar so everything became inter-twined. I always called her, sent her news, postcards and Christmas cards. My sister and I visited her a few times as well. But as you know stitching, deadlines, life, mothers and family take up a lot of time and so basically it was postcards promising visits that were not always made in the latter years. So there you are. Without Mary ( Maureen Pallister and Jean Draper also) I would not be where I am today. It just shows how, without the Internet, promotion was done for others by totally unselfish people who were passionate to spread the word about good practice and contemporary responses to embroidery. … I was put under the wing of June Tilley and then Anwen Nichols to become a verifier for City and Guilds in my early days of teaching City and Guilds embroidery. I travelled to a number of centres with these two experienced teachers and quickly learnt that this was the best way of finding out how not to deliver the C&G embroidery syllabus! Imagine my concern when I was asked to verify the students of the intrepid Mary Youles at Bristol – on my own! As you can imagine it turned out to be a delightfully relaxed experience with some really exciting student work. These students went on to form an exhibiting group called the Brunel Broderers. I learnt a lot from seeing the way Mary approached her teaching and how she devised open-ended project briefs that stretched the student and gently complied with the straightjacket of the syllabus. Mary kindly said I had been very helpful. Since then we’ve often giggled about our first meeting, especially when I first joined the PSG and got to know her better. I often stayed overnight when doing some teaching for groups near Stroud, enjoying the gossip about the various personalities she knew so well in the committees. She enjoyed taking me on scenic detours to show off her beloved hills of Stroud and of course, her pride and joy – her donkeys, Welkin and Hannah. 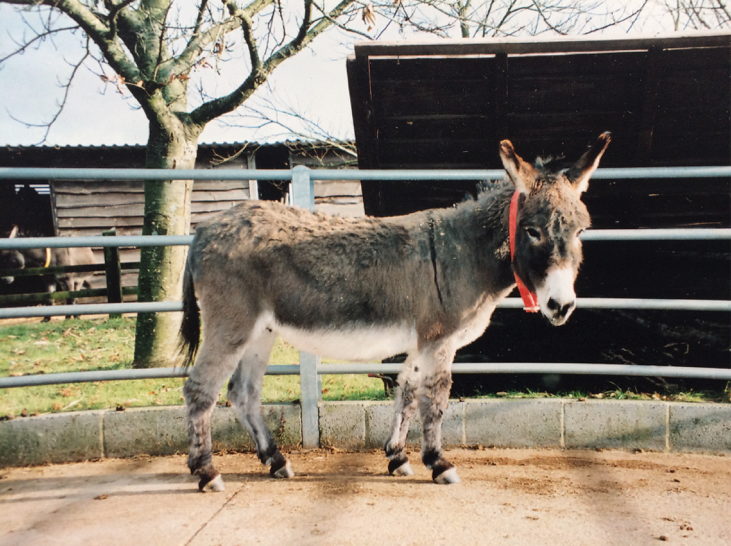 I could hardly believe that Mary would walk down such a steep incline in the donkey paddock to their stable/shed to feed and chat to them twice a day and I know how heart-breaking her decision was to send them to a donkey sanctuary when she couldn’t manage to care for them any longer. Moving our TSG base to Farncombe was a good opportunity to travel with Mary, picking her up at the Stroud Little Chef rather than facing the puzzle of lanes and steep inclines to Mary’s cottage in Nailsworth. Husband Tony would drop her off and collect her on the Sunday. I think Mary enjoyed these trips as it gave her a chance to tell me the life histories of every crafts person who lived between Stroud and Farncombe as we passed the end of their road or she noticed a signpost that mentioned their village! It has been very distressing to see such a talented and individual artist, teacher and special friend gradually fade away. I will always remember her and treasure her friendship that must have spanned over 40 years. Once we relocated to Shropshire Mary was anxious to visit us. She and Tony came and stayed and she delighted in Chas’ sheds, my store of papers and fabrics, which we spent hours talking about while Chas took Tony walking, which exhausted Tony! Then lately on my visits to her at home we have found we had even more connections through my Gloucestershire roots and my time at Art College there. My last visit was in early May, Mary wanted to talk about people, things that she had around her, and be given cups of tea as she was tired and weak. The garden was full of forget me knots, bluebells and lily of the valley, so I will remember Mary in her home surrounded by a sea of blue. 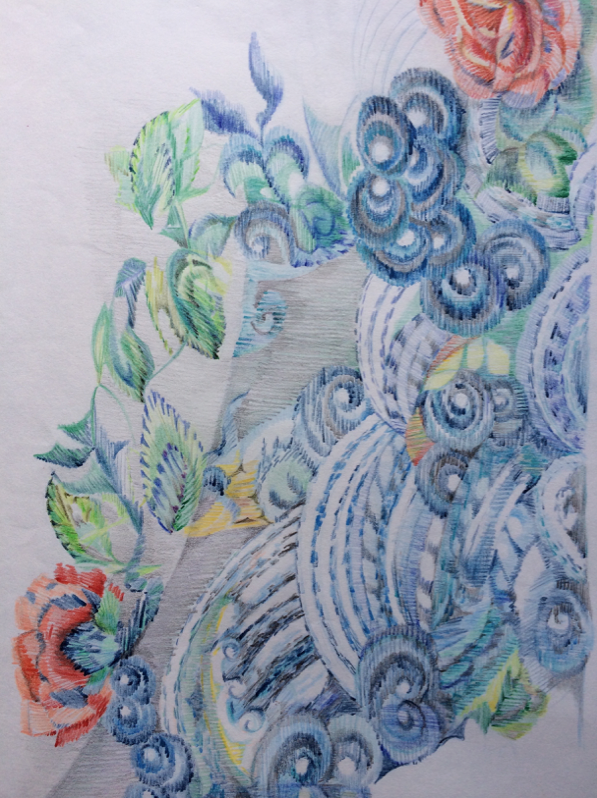 Blue was one of Mary’s favourite colours; part of a personal visual language that along with particular fabric qualities began to feature more and more often in her work in the 1990’s; as did the selection of historical starting points. Both of these come to the fore in her contribution to ‘Embroidery Studio’, published in 1993 in collaboration with the Embroiderers’ Guild and the PSG. Members explored the inspiring aspects of the historical collection within the Guild and showed how they had used this to plan and design an original piece of work. Mary selected a Han Chinese jacket, in navy silk satin with embroidery worked in knots and variations of satin stitch. She produced a variety of drawings of the inside of the stitching and also of worn and faded parts of the garment resulting in a hanging based on the shape of the garment. 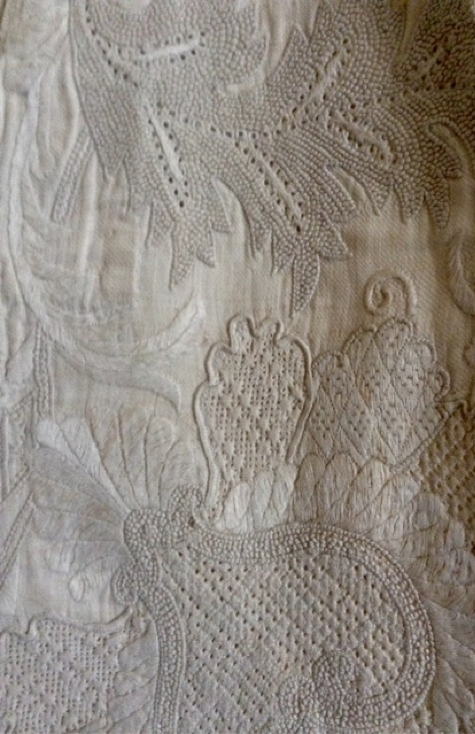 It was worked in fabulous and sometimes luminous blues in frayed silk pieces and machine embroidery. Also of interest is page 178 of this publication where Mary produced a comprehensive diagram of ‘suggested journeys of exploration’, wonderfully exemplifying various starting points from within a single theme. (Perhaps something that I might be minded to think about as the TSG move towards its third publication in 2020!) The historical starting point and the ‘kimono’ shape continued to be of interest for her, as we shall see. 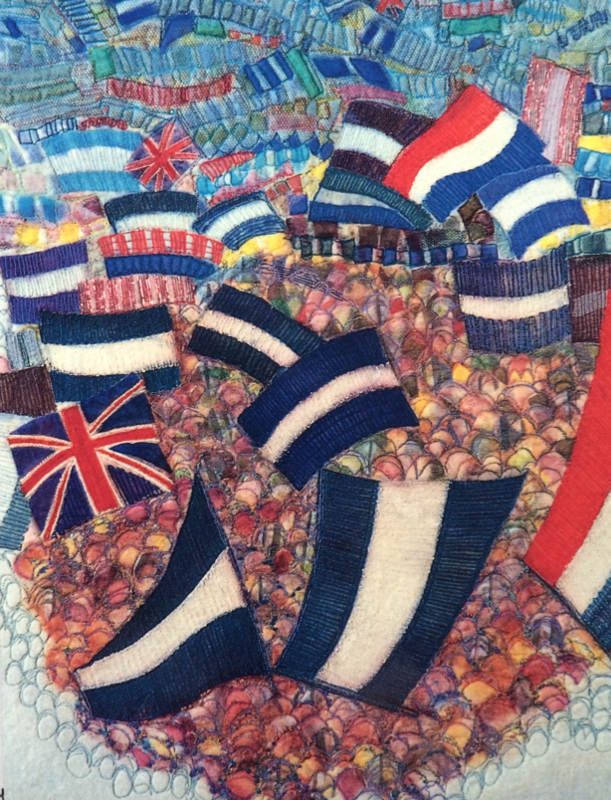 But before I move on I must just mention Mary’s stunning contribution to the PSG New Zealand Exhibition touring exhibition between 1994-96 – Journeys Through Stitch. This was on handmade felt with appliqué, dye, and machine embroidery and reflected her interest in commonplace activities. Saturday Afternoon 72 x 106 cm. Detail. Photo, Gavin Durrant. The donkeys have already been mentioned; Mary had two. Welkin (who got his own press coverage on moving in), and also Hannah. When the PSG was regularly at Hawkwood College in Painswick, Mary would leave our courses in the evening to go home and feed the donkeys and return in the morning with tales of their exploits. Both accomplished more than one escape that featured the local constabulary and formed the basis of hilarious dinnertime stories! One summer at Hawkwood when the wild flower meadow was gloriously full of buttercups and daisies, Mary spirited me off to see a shed she had found made entirely of recycled doors. Whilst she walked around the outside enthusing about the peeling paint, the patched and pieced wood etc, I stepped into the dark interior and saw the sunlit meadow through the gaps between the doors. Afterwards we only had to say ‘shed’ and like a touchstone it immediately brought back that unique creative sharing which was Mary’s special gift, or mischievously suggested a chance to escape! Mary’s cats featured greatly in her life as well. Cards with pictures of cats decorated lots of surfaces in her cottage, many sent by TSG members and other friends. 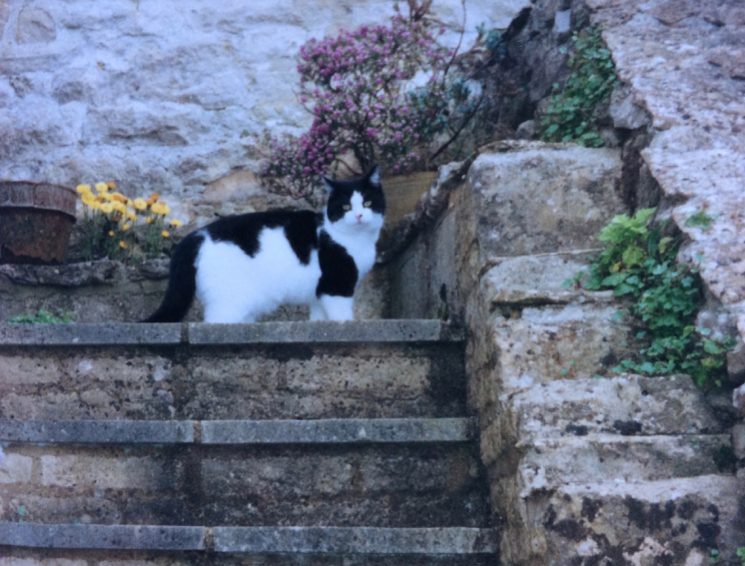 Whizz was Mary’s most recent cat and he kept her company until the last few weeks of her life and he now resides happily with Linda in the village. Whizz, even more at home! I don’t know who sent Mary the cartoon above, but it was aptly chosen! Mary was well known for ‘talking in class’ to the extent that she was often noted to be holding her own meeting whilst another was going on all around her! I remember being invited to speak to an Embroiderer’s Guild group somewhere many years ago and early on in my talk I spotted Mary twinkling at me in the front row – seeing her made me very nervous but at the end of the talk Mary asked me if I had thought of joining the PSG. It had already been suggested by Val Campbell Harding that I might apply and I think Mary had been deputed to hear my talk and see if she agreed. Luckily for me she did! ‘Mary came to stay with me while on a visit to Edinburgh not long after I became a member of the TSG. That memory has and will stay with me forever, thanks to one of my most treasured possessions, which was a thank you gift from her. It has pride of place in my living room and not a day goes past when I don’t admire it and think of her. Mary was an exceptional woman. A fantastic artist, a marvelous teacher who could lay her finger on the very essence of what was bothering you about your work and suggest a resolution to send you back on the right path. I always looked forward to our workshop weekends when she would have a wander past and let you know what she thought. She was frank and forthright in her opinions but so, so encouraging. She was in essence the kind of person the TSG searches out, a superb artist, a brilliant teacher and communicator. I certainly benefited from her expertise and will miss her enormously. Mary was such a great person. I always loved her company, always funny and at the same time deadly serious about our work and the PSG. She could always be relied on to put her finger on exactly what you were struggling with and to encourage you to keep going. I feel very blessed to have known her. Mary also ‘found’ PSG members from within the City and Guilds groups that she taught or visited. The first time I met Mary was while I was a City and Guilds student in Cheltenham under Maureen Pallister’s tuition. She visited our class for two weeks running in order to teach us the rudiments of lino cutting. I still have the block and remember how well we all responded to her direct approach. On another occasion she taught us some experimental goldwork based around our own drawings of jewellery, four small samples using sheers and bright colours as a background with alternative gold threads. At the end of our Part 2 show she bought this from me as a teaching aid, and it was later on exhibited at the RIBA exhibition of City and Guilds work. Courses at Hawkwood College, Stroud, which Mary and Jean organised were highlights in my year, they were always inspiring, stimulating and with new approaches to try out. I would go home with ideas buzzing. I will always be grateful to both Maureen and Mary for putting my name forward to be considered as a member of The Practical Study group as it was known at that time. It meant so much to me. Mary was always very encouraging and as the years went by I got to know her better. Her love for her donkeys and cats and her sense of fun and good humour always came through and we would often have long chats on the phone. I will miss her greatly. We went back a long way, sharing many teaching events and journeys together. Her stories are legendary and often hilarious. I shall remember her with great fondness and gratitude for all she taught me. She contributed a great deal to the group as a whole, as well as supporting individuals. 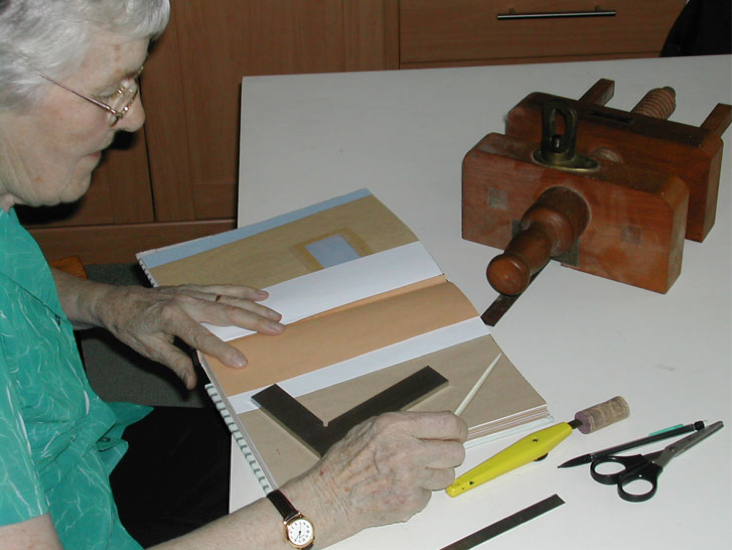 Between 1997 and 2000, whilst still teaching her City and Guilds groups, Mary undertook a part-time course in Bookbinding at Bristol City College and from then on undertook this new direction in her work with her usual passion and enthusiasm. She was teaching this new subject, becoming a regular visiting tutor on Textiles and Book Arts and other courses at Stroud College. 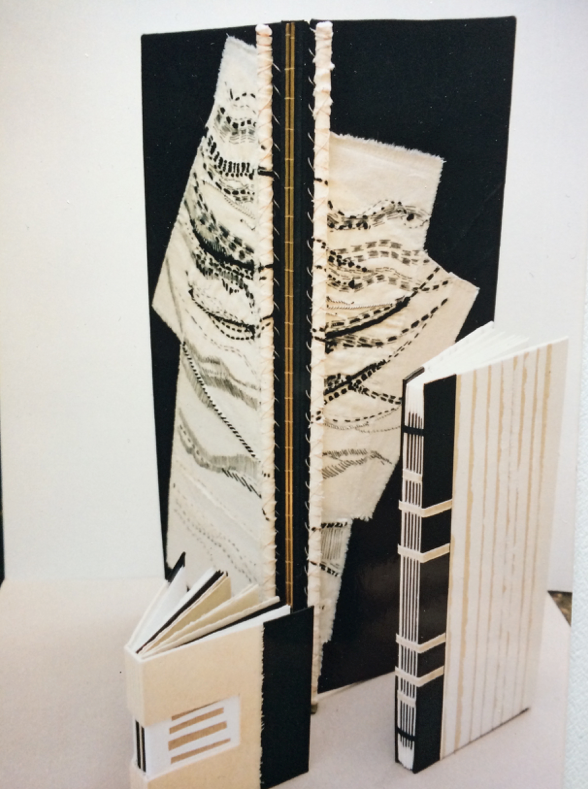 She joined the Society of Bookbinders and exhibited her books, sometimes uniting her textile work on the covers and sometimes producing a group of books that reflected a more abstract interest taken from her visual inspiration in sheds and pigeon lofts, both are shown below. ‘I wish I was a Kite’ was the first handmade book that Mary exhibited with the PSG. It was in the ‘Bold as Brass’ exhibition, which opened at the Cajobah Gallery in Birkenhead in 2001 and then toured to four other galleries into 2002. From this first exhibited book Mary more frequently exhibited handmade book forms rather than textile panels. She took part in many local shows in Gloucestershire and her passion for sheds and pigeon-lofts became established. One or other interest was featured in subsequent PSG/TSG exhibitions with Mary taking part in all of them. 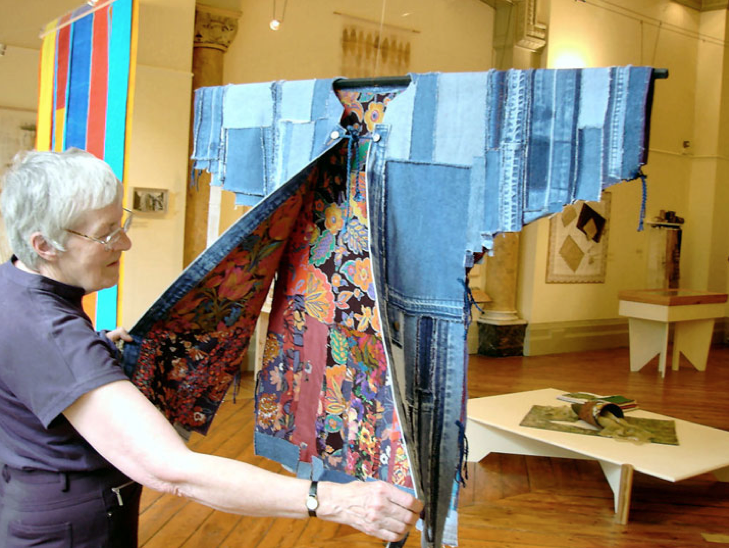 ‘Not What it Seams: Further Thoughts’ was at the Bankfield Museum, Halifax in 2005 and Mary showed Coat – something old something new. 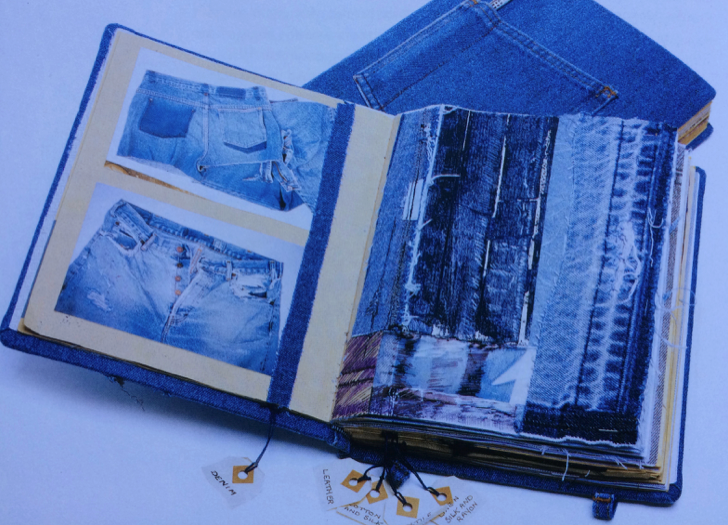 Her interest in Denim as a fabric was used to demonstrate the wear and tear of working clothes, providing evidence of a visual history of hard work in many trades. She found denim jeans particularly fascinating as deep blue indigo dye was still hidden away from the light inside seams and pockets. The ‘T’ shape of many traditional robes and the patched, old, printed dress fabrics are reminiscent of the lining of many ethnic garments. ‘Colour – I am a split personality! I want it. I want it now! Buy, borrow, steal, and collect – all without a considered plan. I arrive home with more, more turquoise, or more magenta, paints, pastels or threads when I already have masses! In the garden I buy plants because I have to have them, hardly considering where I can find a space for them. Denim is my comfort blanket, the older and more frayed, the better, such a gentle colour showing a history of wear and hard work. Old, used brown paper is a favourite for drawing and for my book structures. Calico too is a wonderful, honest, fabric, which shows up such lovely shadows, creases and pleats. Colour is life, continue to enjoy every moment of it! In 2008 Mary took part in the ‘Creative Dialogues’ exhibition by presenting an ‘artists book’ that explored the connections between those of us in the group by making the book with allotted recycled pages for each member to complete. It functioned alphabetically, starting with Youles and ending with Berry; working it’s way through the group, round the country, popping through each letterbox with a two-week timescale for us to complete our contribution and post it on it’s way again. All we had to do was make a visual connection with the previous recipient, not always that easy. 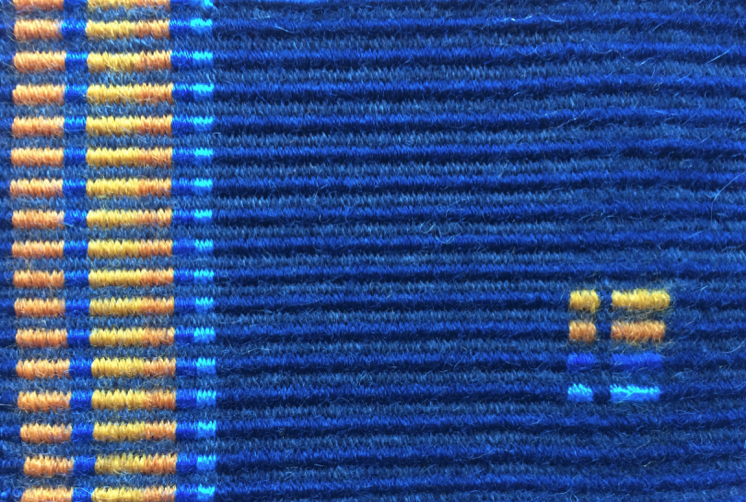 Each contribution can be seen on our website textilestudygroup.co.uk, select ‘exhibition’ from the left hand menu, then ‘exhibition archive’, then Creative Dialogues: Mary Youles Book. The cover for this one was neither denim, nor calico, but an equally serviceable ‘work’ fabric – black and white ticking. No surprise where that idea came from! 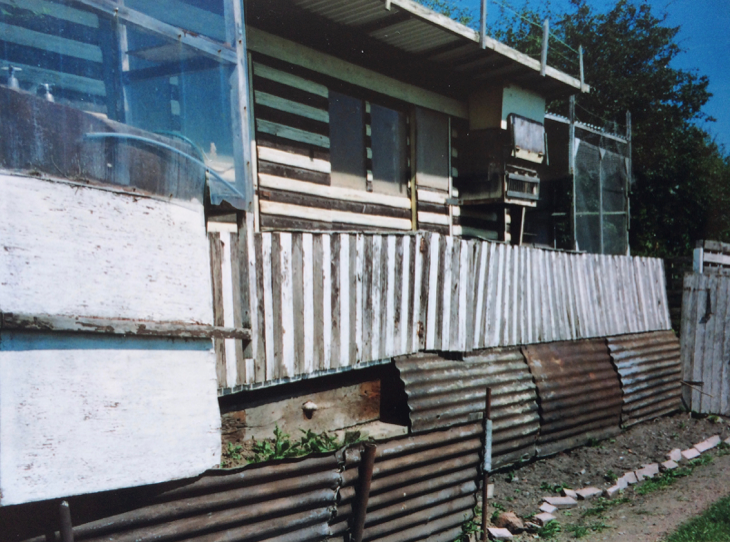 Just one of scores of photo’s of sheds / pigeon lofts / beach huts that formed the starting point of many pieces of work. 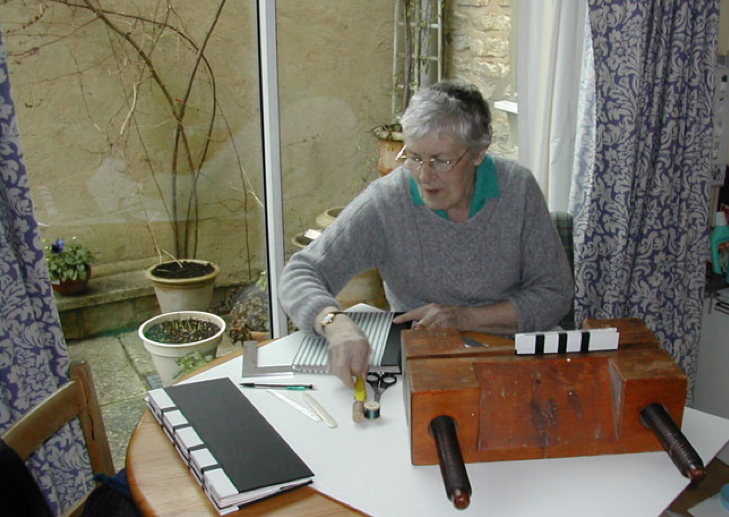 Despite this busy exhibition commitment and all her bookbinding activities, in 2009 Mary still found time to contribute to local life by becoming a committee member and assistant organiser for the prestigious Stroud International Textile festival. 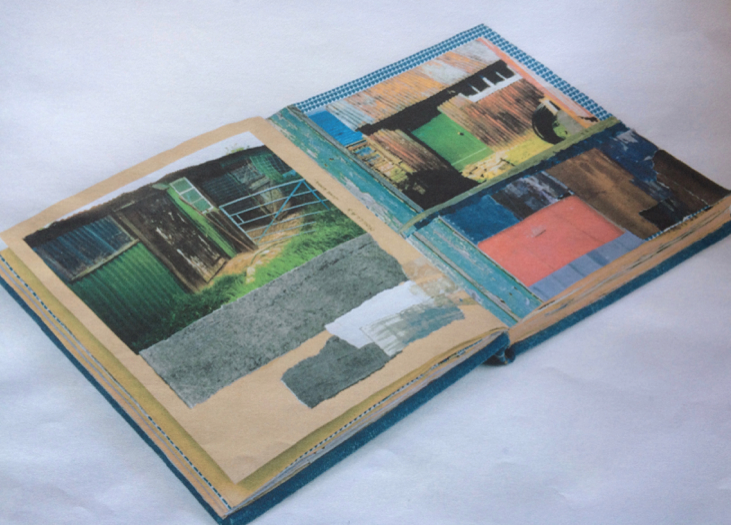 Considering how much enjoyment Mary gained from the colour and the prolific investigation of sheds and pigeon lofts it is doubly sad that her lovely source book was stolen from the PSG exhibition Visual Thinking–Unpicked, at the Hub, Sleaford in 2010. It was full of photographic records and visual interpretations to inspire new pieces of work. For Mary it was devastating, she said that she felt as though someone had stolen her life. The cover of this lovely book had a jeans pocket with a pencil in place, a subtle, double reference to the idea of ‘work’ embodied in the presentation. The ‘pigeon lofts’ research book at the back with its companion ‘denim’ research book open in the foreground. Despite this body blow Mary contributed a lovely panel to our next exhibition ‘Individual and Collective’, which toured all the Knit and Stitch Shows in 2011. In this quiet panel Mary returned to her interest in appliqué and ‘op-art’, but interpreted from the sheds/pigeon lofts research. The whole exhibition can be seen on our web site following the instructions above, but changing the exhibition selected. This was her last exhibition with us. Mary’s eyesight gradually declined after this and she stepped down from full membership to associate membership. ‘a wonderful role model to us all, because of your challenging work’. 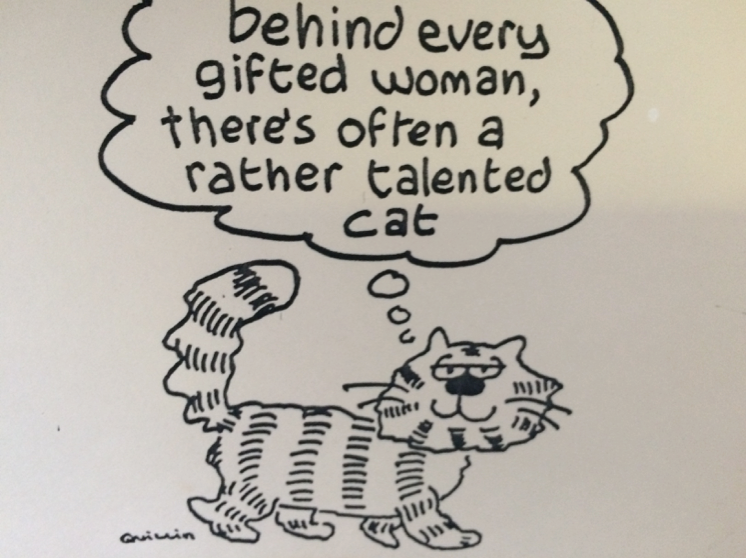 This indeed sums up Mary……..how lucky we were to have known her’. These difficulties didn’t stop her interest; some of her last sketches, samples and screen shots drew on motor racing, an interest that pops into her visual notebooks from the 1980’s, through to the present day. 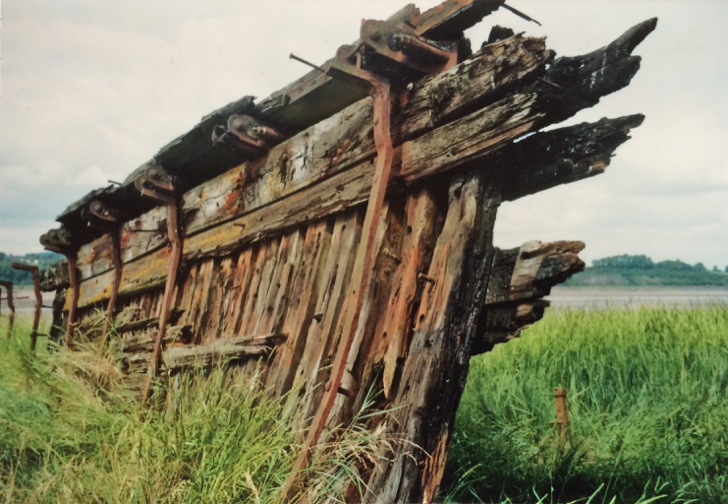 She also had a lovely photographic record of boat structures and continued to attend our professional development workshops, sharing her advice, gossip, naughty streak, materials, nattering through meetings and, of course a G&T! 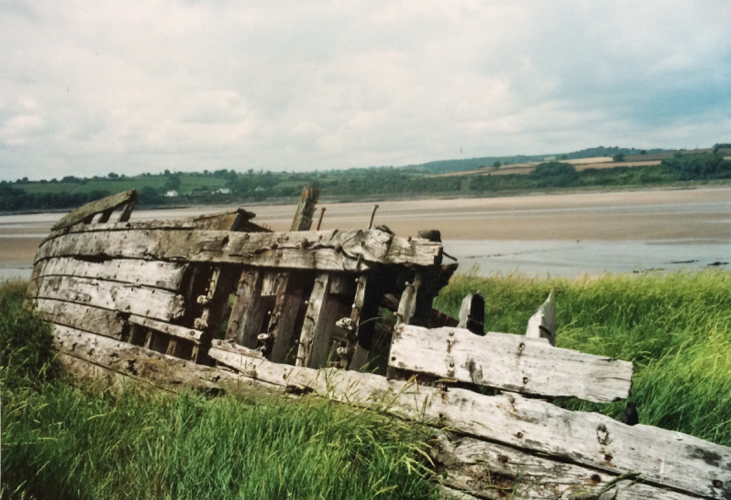 The ‘Purton Hulks’ on the banks of the river Severn. Just two of a number of photographs taken by Mary in 2010 as new starting points for work. This lovely description of the transformation of something as ordinary as air into something as wonderful as music is the sort of transformation many teachers seek. You take something ordinary – pieces of fabric – and you help someone else find the magic in them – Mary was one such teacher. Her advice was well thought out, keen, sharp and delivered with a sense of humour. For many students she inspired a change of direction in their lives and she will be much missed. ‘Like all TSG members I have particular memories. I will miss her mischievous and subversive streak; her laughter and delight in gossip and the ridiculous; her kindness in sharing what she had in her bag of ‘requirements’; her acceptance of strange new materials and the possibilities in mine. To me she always seemed to be learning something new, but had such stories about her family background and her teaching and ‘making’ life. She was generous with her interest and she stunned the whole class at my Summer School course by interrupting that final summing up session to urge us all to not stop doing, making, learning, enjoying the process… ever. Mary (on the left) and our current Chairwoman Bobby Britnell supporting the TSG at the opening of DIS/rupt at Stroud International Textiles in May 2017. Kay Greenlees, on behalf of all members and associates of the Textile Study Group 2018. Summer has come and gone and what a summer it has been – well I hope for most people. However, Autumn is very definitely on its way; the trees are changing colour, it’s been quite windy and of course the temperatures have dropped. Last weekend the group met for their twice yearly get-together and thoughts of balmy summer days were just a memory. Over the summer three of our members, Ruth Issett, Dorothy Tucker and Alice Fox, taught at our Summer School but more of that in another post. We wanted to focus on other news this time. One of our members has had a hectic and exciting summer. 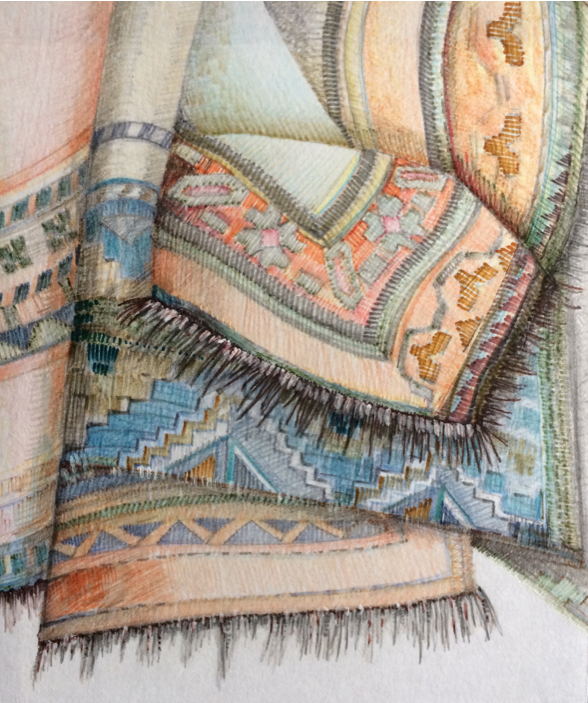 With the launch of her new book, Sketchbook Explorations, the last few weeks have been very busy for Textile Study Group member Shelley Rhodes. Well known as a group member and teacher, Shelley found time to answer some questions when we caught up recently. I started by asking what it felt like to see the finished book for for the first time after all the work producing it. It is amazing to finally see it in print. It seems like a long wait from handing everything in, to finally holding a copy of the finished book. I have been working in sketchbooks for many years without the intention of them ever being seen, so it is quite strange but thrilling to see them reproduced. I think Batsford have done a great job with the printing. We worked hard together on the layout of each page, as I wanted a really crisp, fresh look to the book. However, I also wanted to show multiple images from a sketchbook, rather than a single open sketchbook page. I think we achieved this and I am really pleased with the overall look and feel of the book. What has the process of writing a book been like? Like everything that is new it has been quite hard and there is always a steep learning curve. The initial writing came quite easily, but just getting everything in some kind of order took a lot of time. Working in sketchbooks is not a linear process. There is a lot of overlap, so I had to keep checking that I wasn’t repeating things. The final edits, reading through, moving chunks of text and rearranging the order took a long time. Similarly, finding the right images to illustrate each point was challenging. How did you approach the process? Getting started is often the most difficult thing. I tried to maintain a rhythm of working on it regularly in small chunks. Some days I didn’t feel ‘in the mood’ but I just had to make myself do it on those days by telling myself I’d just work on it for an hour. Then I would often find that once I got started words would begin to flow. Did you have a clear concept of how you would go about the work? I had a clear idea of how I wanted the book to look and I knew that I wanted to show the work of other artists and their approaches. I didn’t want a ‘gallery’ of their work in the book but I wanted to integrate their thoughts, words and images throughout the book. So I started a ‘conversation’ with each of the artists. Then there were a lot of emails, back and forth as well as face to face conversations with some of them. What were the main ideas that you were trying to get over to the readers? I really wanted to share my passion for sketchbooks and encourage others to use them regularly. 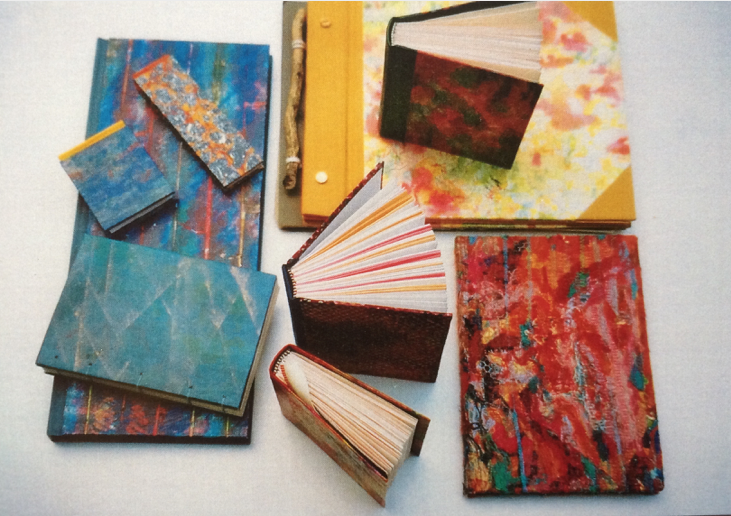 I want to show how sketchbooks can be used in different ways and for different purposes. There is no right or wrong way of using them. They can really help with ongoing projects, development of work, exploring and experimenting, research as well as recording your travels or as a daily visual diary where you record anything and everything with no particular theme. How important do you think it is to have and maintain a habit of regular, if not daily, drawing? The more you do anything, the better you get at it. Confidence grows through practice and I find my drawings become stronger and more positive by working on them every day. I find setting a daily goal really pushes me to focus and complete a daily creative act. A lot of people are nervous about ‘drawing’, how do you advise people to start creating that habit of visual note-taking? I would suggest starting by collecting or using collage. Arrange ephemera, tickets and found objects in your book along with notes and words. Or you could try creating small colour swatches based on your observations. The important thing is to start looking and recording. What are your favourite materials when you make your personal visual notes? I use a fine line pen, mechanical pencil, dip pens with ink, washes of watercolour paint and often chalks. I like to use layers of different media on my sketches, drawings and mark-making. Often, I will work on top of a collaged or prepared surface, rather than a clean sketchbook page. What is next – what plans do you have for the next few months? I am having an Open Studio Weekend at my studio near Burton in Kendal on 29th and 30th September from 10 til 4 each day [further details on my website and Facebook page]. I plan to show lots of sketchbooks, work and drawings that feature in the book and I will be selling copies of it. I have a full schedule for teaching for the rest of this year and for 2019, teaching in my studio, throughout the UK and abroad. 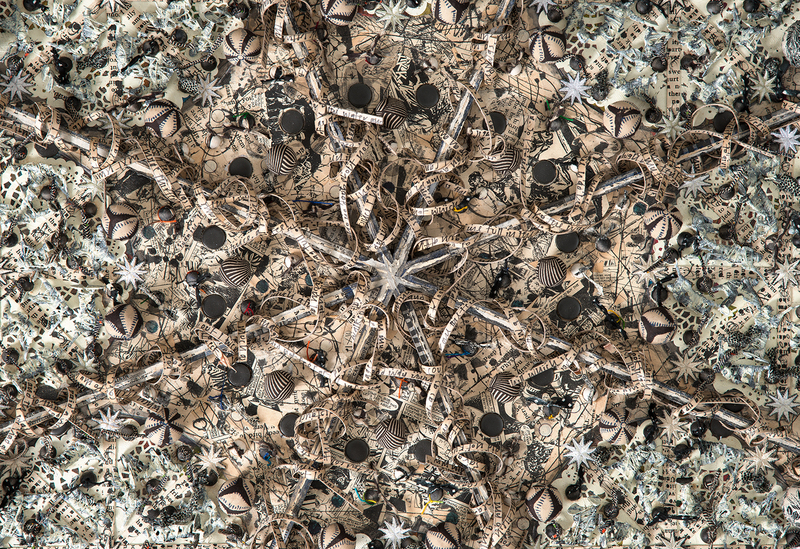 Also I am continuing to develop my own work for exhibiting. Finally, Shelley what is the book’s title and where can your book be bought? 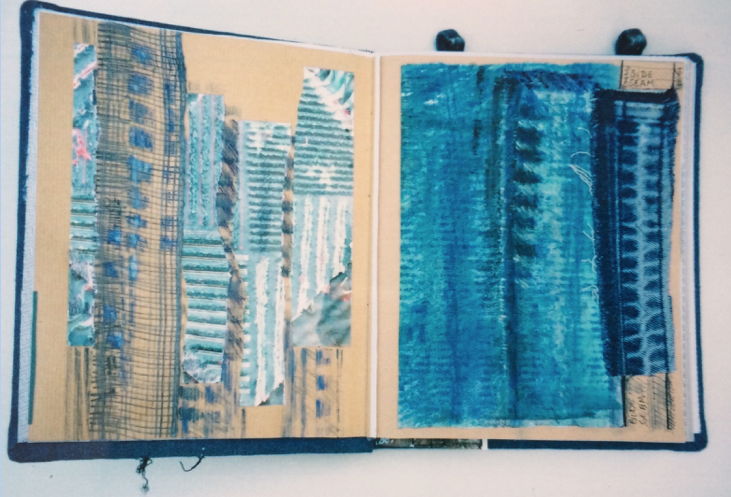 The book is called Sketchbook Explorations – for mixed media and textile artists. It is available to buy on line at various online retailers. Also, Waterstones and other high street bookshops sell it. I have copies to sell at my Open Studio and when I teach workshops and give talks. Sketchbook Explorations by Shelley Rhodes is published by Batsford. Photographs by Michael Wicks and Shelley Rhodes. Thank you Shelley, I know it will be very popular and will be of enormous help to many people who are maybe a little tentative about the designing process and using a sketchbook. We recently received an email to say that this blog had been placed third in a list of UK Textile Art blogs which is very exciting. So thank you everyone at Feedspot and please go to their website at this link to see the post. More news about DIS/rupt in Peebles coming soon but by all accounts good viewing numbers at the gallery to see the work. 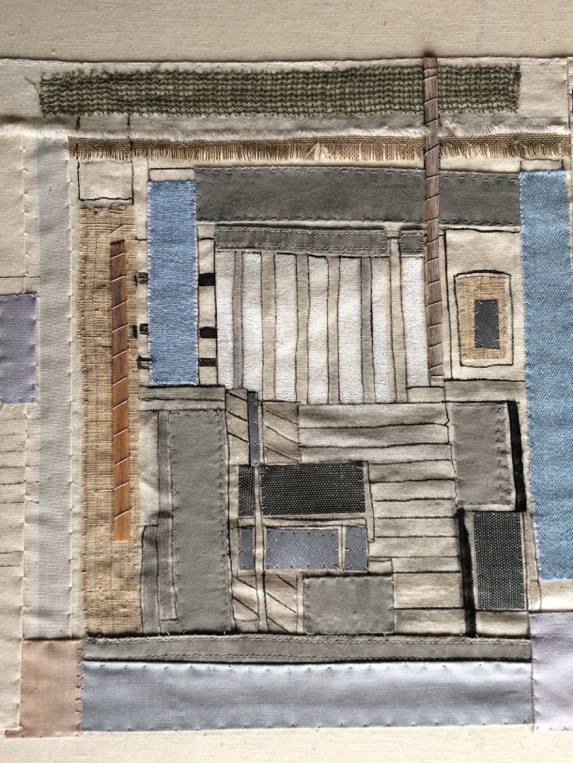 This weekend Saturday 30 June, Textile Study Group member Mary Sleigh will be teaching a workshop, Stitching a Story. Booking is essential and further details can be found by contacting the Tweeddale Museum and Art Gallery at 01721 72480 or email museums@liveborders1.org.uk to see if there are any places left. 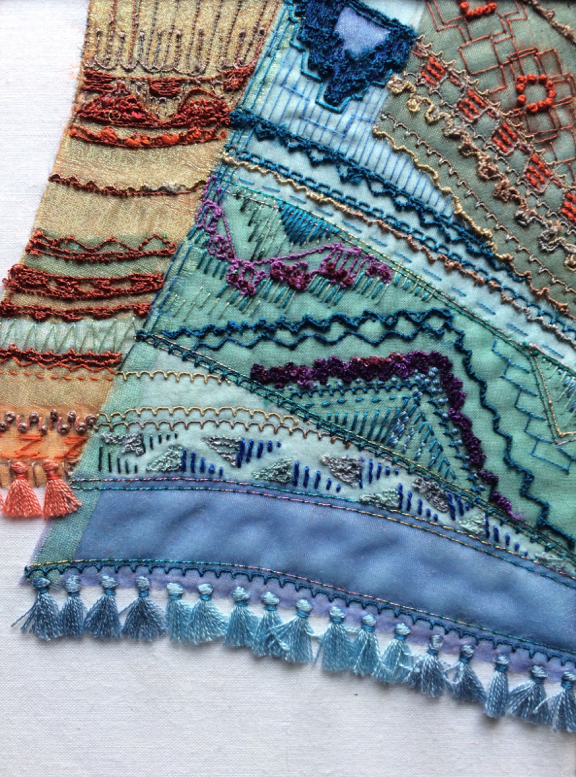 On Saturday 7 and Sunday 8 June another member, Julia Triston, will be teaching and more information about her class Text in Textiles can be had at the same contact numbers above. 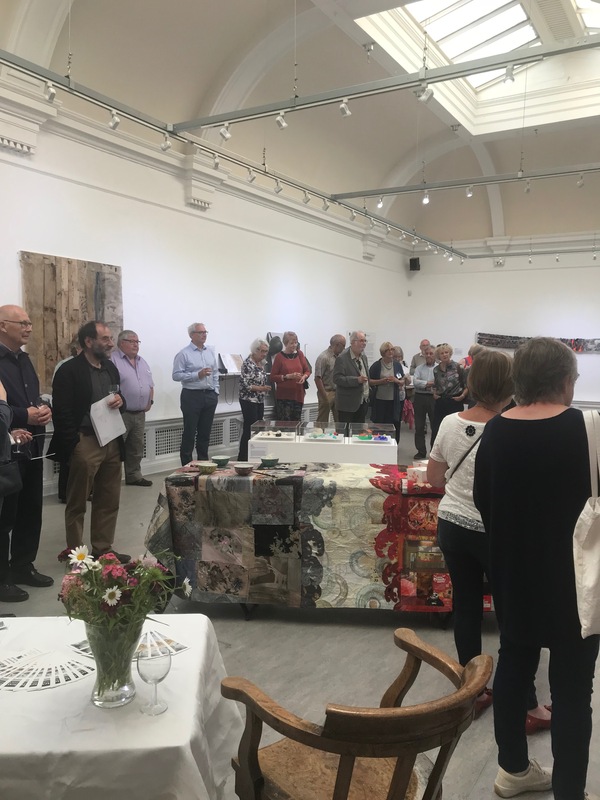 The opening of DIS/rupt on Friday evening at the Tweeddale Museum and Art Gallery was lovely and the large group of people who came to see the work in its new temporary home were fulsome in their praise of the venue and, of course, the work. It never ceases to amaze how different a body of work can look when set up in a different gallery. The galleries in the Tweeddale Art Gallery are lovely – the main gallery has wonderful ceiling windows which create a sympathetic light atmosphere and the work has space to ‘breathe’. The lower gallery is also well lit and shows the work to great effect so the group is very pleased with this finale to the DIS/rupt Tour. Entry to the Museum and Gallery is through an archway off Peebles High Street into a lovely historic courtyard where visitors will see one of Ruth Issett’s colourful pieces on the wall of the Gallery. There is parking nearby as well as on-street parking if available and Peebles itself is a lovely town set within the Scottish Border countryside with many independent shops and local attractions so well worth a visit. 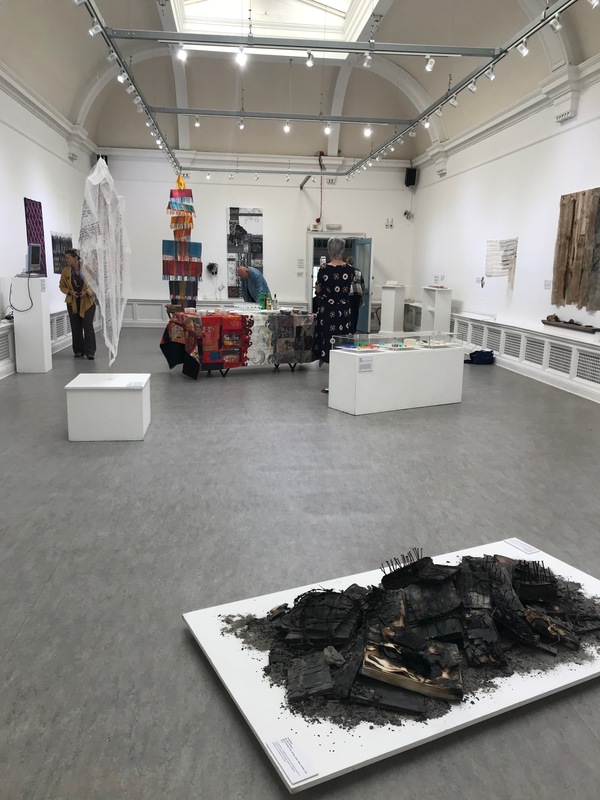 The team from Textile Study Group and the Gallery staff have done a wonderful job hanging the work and visitors will be met with a very interesting “thought-provoking” exhibition. Full details for opening and access can be found at the gallery website and remember there is a series of workshops programmed for the period the exhibition is open run by Textile Study Group members. 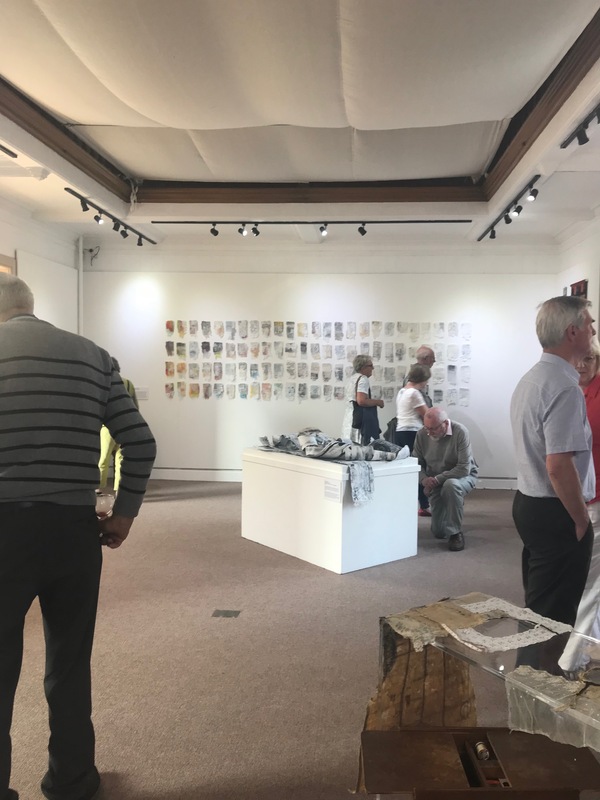 Already two weeks since DIS/rupt opened at the Minerva Arts Centre, Llanidloes in Wales and we have had good feedback from visitors who have been. It is always exciting to see how the work changes as it is set up in different surroundings and becomes part of the new gallery for the duration of its stay. The lighting variations, as well as the physical space alter how visitors view the pieces which means that each new gallery keeps the experience of visiting fresh. Here are a few photographs. 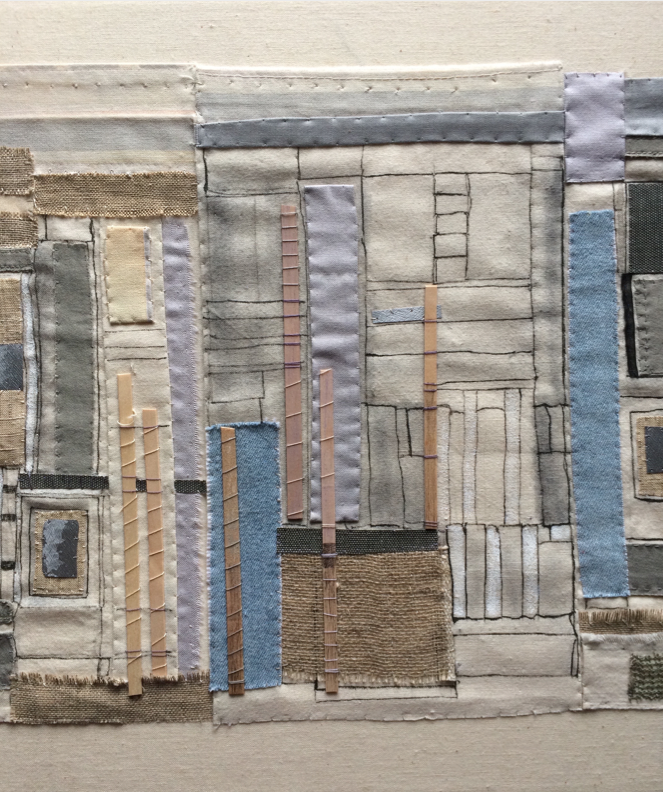 One of the main tenets of the Textile Study Group is continuing to develop our individual professional practice and therefore the twice yearly weekends when we meet up to work together, are opportunities to explore the professional practice of other practicing artists as well talk amongst ourselves. 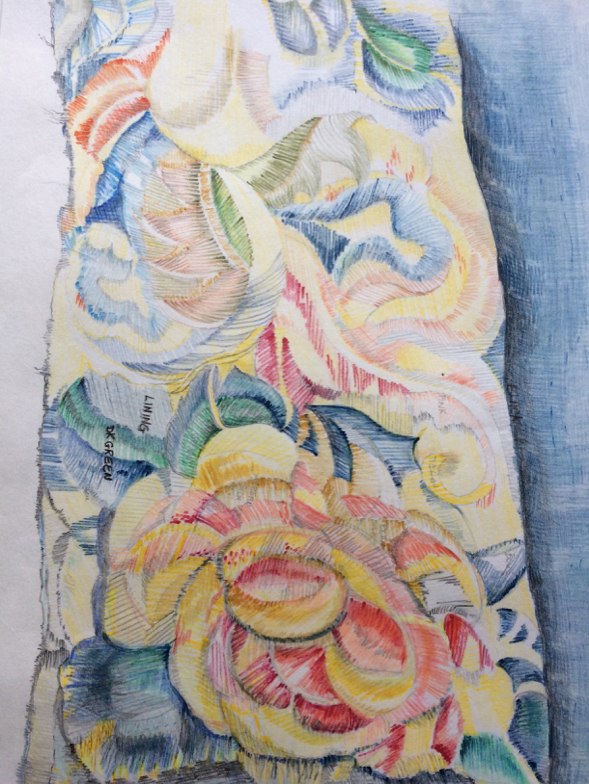 Recently the group members met and enjoyed an inspiring workshop with textile artist Debbie Lyddon. Many of you will know of Debbie and maybe follow her blog or have seen her work in exhibitions, so during a very busy few days I took the chance to speak with her and ask about her practice and inspirations. Q Debbie, have you always been a textile artist? A No! I started life as a musician, playing and teaching the flute and I trained for four years at the Royal Academy of Music. Q2 So how did you get started in textiles – what was it that clicked? A It was always a question of ‘do I do music or art?’ The school I went to had a very active music department and so, at that stage, the music won. However, I have always drawn and painted and I come from a household where everyone knitted and sewed. I’ve always seen playing the flute as an activity that went alongside these ‘hand’ occupations. When I had my children and it became impossible to pursue a musical career it was a very short step to making art instead. I started with adult education classes, putting one child or other on the crèche, and the whole thing has snowballed from there. Q What are your main influences? A My main influences come from what interests me and the experience of those interests in my life. Music has obviously had a strong impact. When you are at music college one of the things you are trained to do is to listen. You can’t play in an orchestra without hearing and understanding what everyone else around you are doing. The concept of noticing and experiencing that is inherent in my practice stems from my learnt sensitivity to hearing everything that goes on around me. Q The landscape is obviously a huge influence on your work. Can you give us a flavour of what it is about the Norfolk landscape that inspires you? A The Norfolk landscape has a huge bearing on almost everything I do. It’s an environment where I have spent a lot of time and the place has got into my bones. I think the contours, the light and the atmosphere of the landscape would come out in my work even if I didn’t try. It’s primarily a place of change. The enormous open skies, the muddy creeks and waterways of the marshes and the sand and dunes on the beaches are forever in flux. They move almost day by day and if I’ve been away for a period of time the differences are immediately noticeable. It is this variation that brings me back again and again as there is always something new to see or to hear or to touch. Q What are your materials of choice? A Cloth is at the centre of almost everything I do and I take inspiration from the way it is used in this coastal environment. Sails, tarpaulins and other protective cloths are my primary inspiration. I use mostly canvas or linen, the traditional material for sails, and the sewing techniques use reference sail-making techniques. I have researched how these ‘coastal’ cloths would have been preserved and waterproofed and use the relevant materials: wax, linseed oil, bitumen and paint. Recently I have been using materials gathered from the environment to colour cloth and to make paint: chalk from Hunstanton and West Runton, red clay from Cley beach, yellow ochre from West Runton and seacoal from Wells beach. I love the fact that I am using materials from the landscape to evoke the landscape itself. 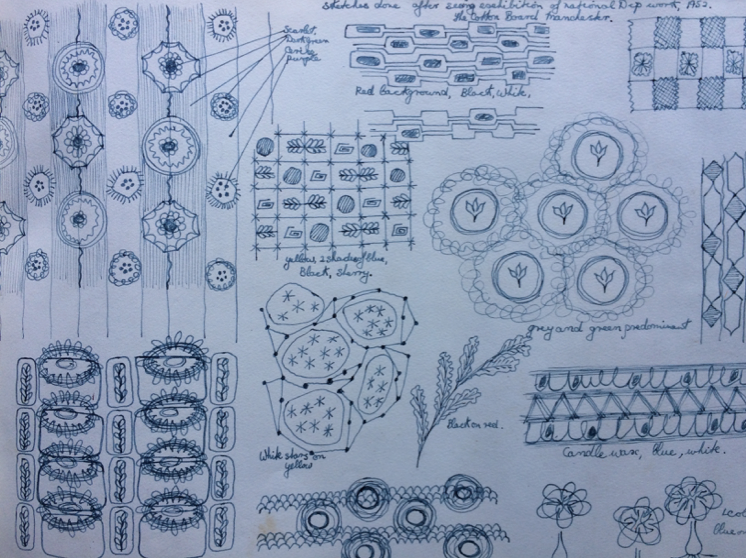 Q Your sketchbooks are wonderful, are they your primary source of ‘note-taking’? A Yes and no! I often take my sketchbook and very basic drawing materials out with me. I like to sit and to look and to listen, and drawing or writing down my observations are an occupation that makes me be still and to actively notice. 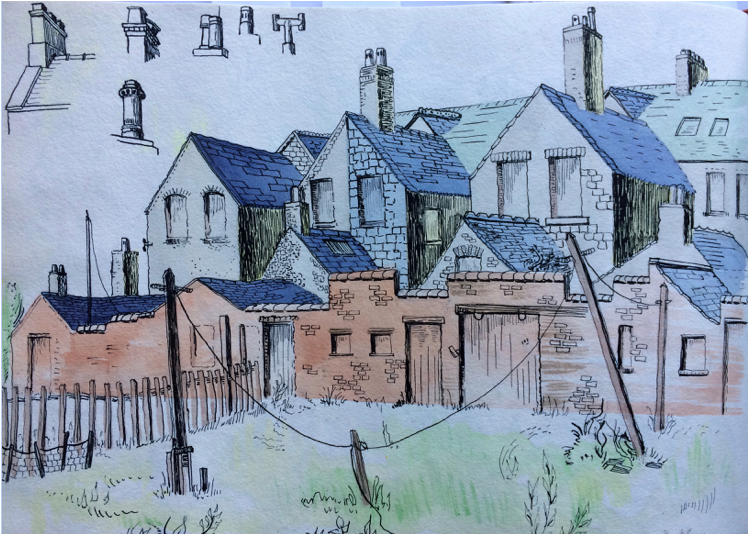 However, I don’t always have a sketchbook with me and I often use the memory of experiences that I acquire whilst out walking in my practice. I find that on a walk there are some memories that are stronger and more intense than others. These stick in my mind and often can become the germ of an idea. Q Your enthusiasm has been evident this weekend, do you enjoy teaching? A I do enjoy teaching. I like to meet people and to share my interests and it is very rewarding when everyone is enthusiastic back. Q Who have been the main inspirations or influences in your textile career? A Surprisingly enough, not that many textile artists: all the St. Ives artists for their connection to place. Gillian Lowndes for her innovative use of materials and Joan Livingstone for her large, abstract forms and use of utilitarian stitch. Q What do the next few months have in store for you and your textiles? Q What one piece of advice would you give someone starting to develop their own textile practice? A Make work that is personal and is about you and your interests. Thank you very much Debbie, for an inspiring weekend but also for giving of your time to talk with me. What you say will be of enormous interest to our readers and we can but wish you well with the projects you have lined up for 2018. If you would like to see more of Debbie’s work then find her website here Debbie Lyddon. Her blog can be found here Debbie’s blog and have a look at the links Debbie has added for information about the exhibitions and visit if able.